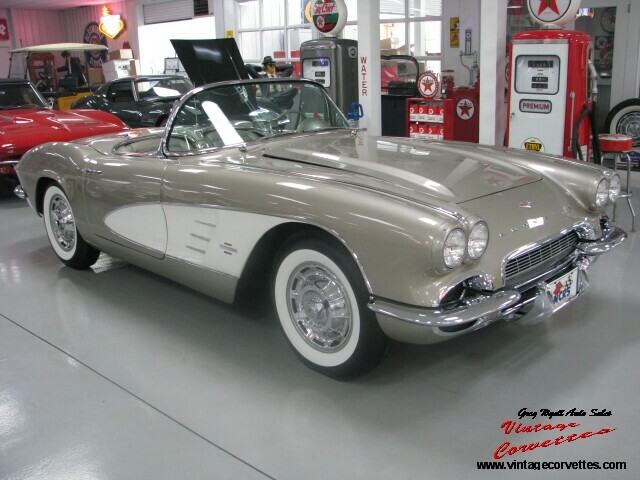 1962 CORVETTE FUELIE – ALMOND BEIGE – JUST IN!! 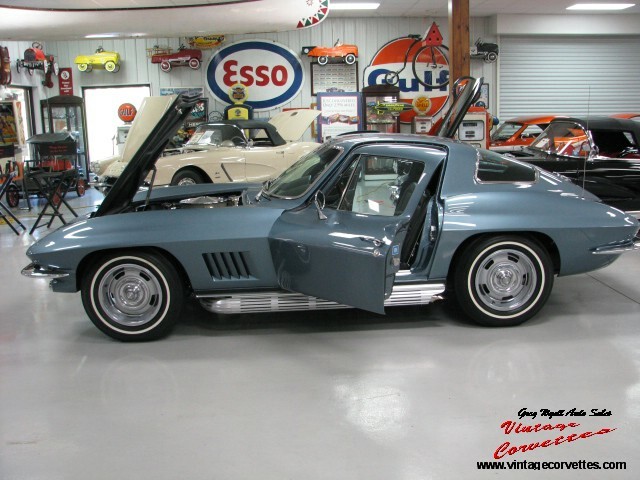 1966 CORVETTE TROPHY BLUE SURVIVOR NCRS TOP FLIGHT 327- 300HP – JUST IN!! 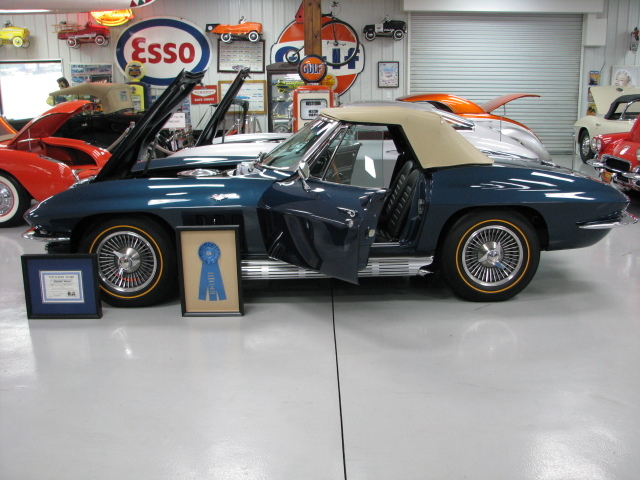 Rare Trophy Blue with Blue Interior, Auxillary Hard Top, White Soft Top, All Correct Matching Numbers L75 – 327 – 300 HP, 4 Speed Transmission, AF-FM Radio, and WW Tires. 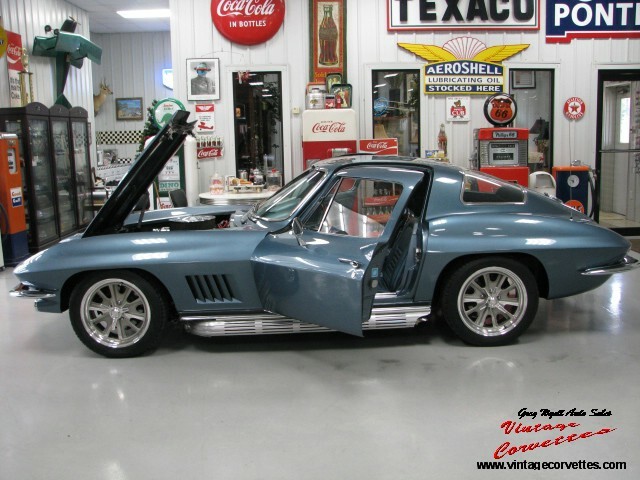 This is a Two Owner all Original 1966 Corvette that has been Judged by the Best. It has Won Multiple NCRS Top Flight Awards. NCRS 3 Star Award, and Bloomington Survivor, Gold and Benchmark Awards. It is in Exceptional Original Condition! All Documents, All Awards and Judging Sheets come with the Car. 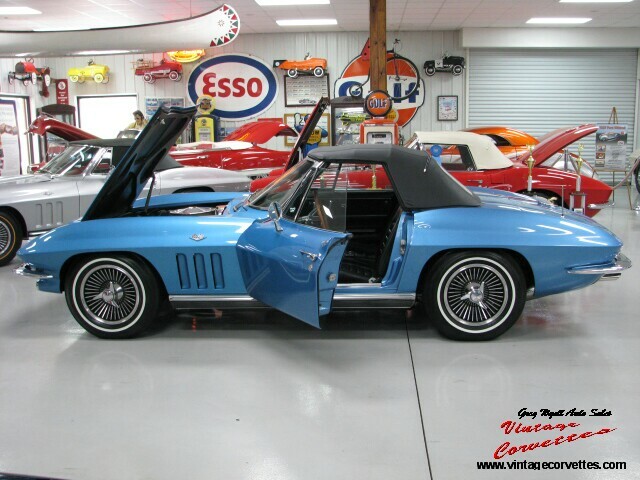 This is a Beautiful Corvette in a Rare Color. 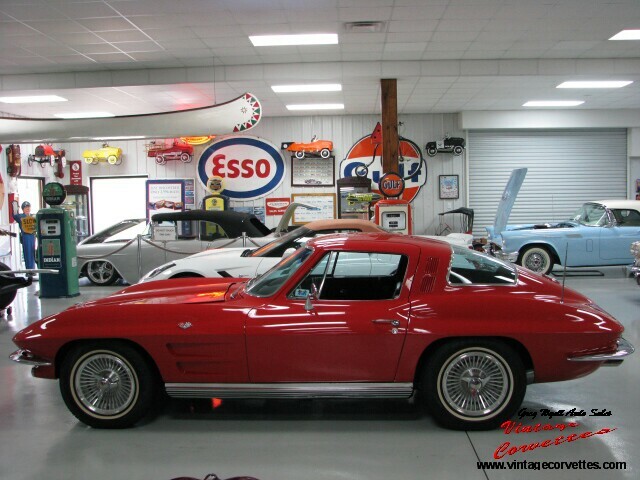 That Looks, Runs, and Drives Like an Original Corvette Should. 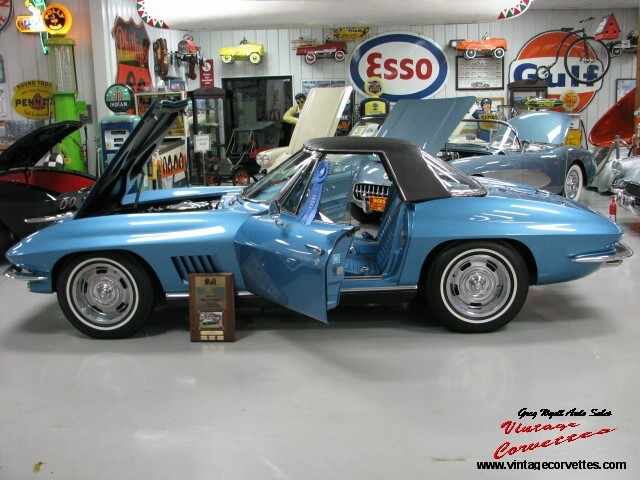 The Best Original Trophy Blue 1966 Corvette Offered for Sale Today! 1972 CUDA 340 DARK GREEN METALLIC 240HP 4-SPEED- FACTORY AIR- JUST IN!! Dark Green Metallic, Black Interior 340 Heavy Duty 4 Speed, Bucket Seats, Tinted Glass, Factory Air,Tachometer, Chrome Dual Exhaust, Vinyl Top-Black, Console, Build Sheet, Car Production Sheet, Owner Manual, and Original Title, Complete Frame Off Restored to Show Condition, All Correct Numbers Drive Train. One of the Best 72 340 Cuda’s Offered for Sale Today! 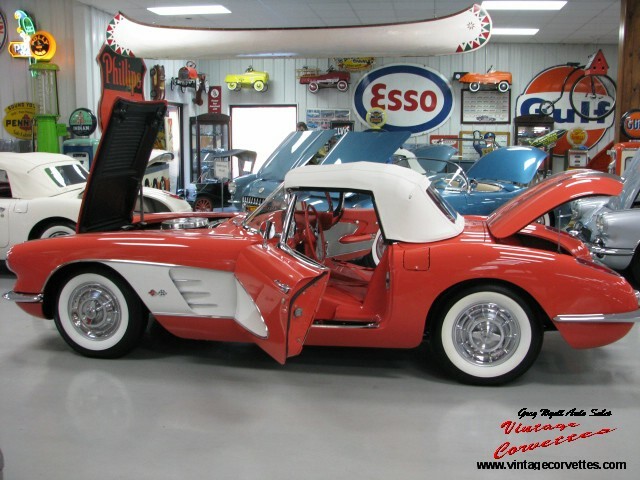 1957 CHEVROLET BEL-AIR CONVERTIBLE- JUST IN! 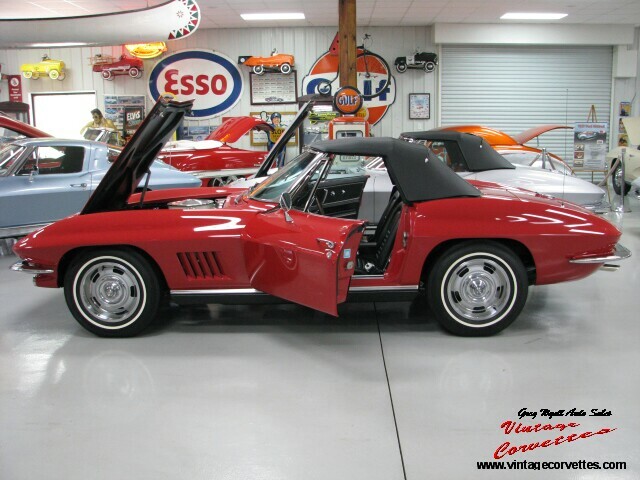 RED WITH RED AND SILVER INTERIOR, WHITE SOFT-TOP, 283 POWER-PACK ENGINE, AUTOMATIC. DUAL ANTENNAS, DUAL SPOTLIGHTS, FENDER SKIRTS AND TISSUE DISPENSER. 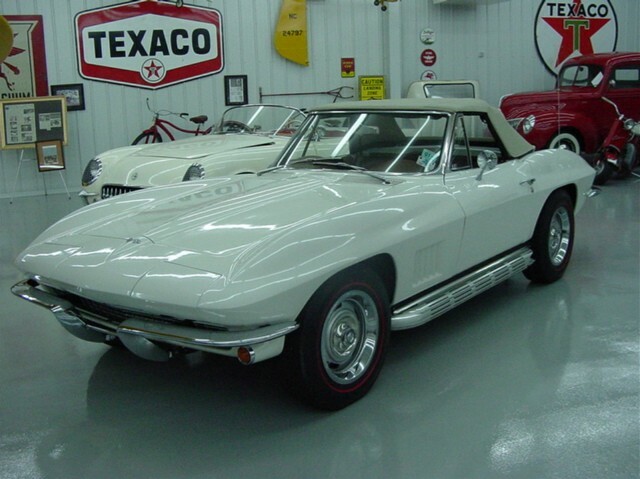 POWER STEERING, COMPLETE BODY-OFF RESTORATION TO SHOW QUALITY. 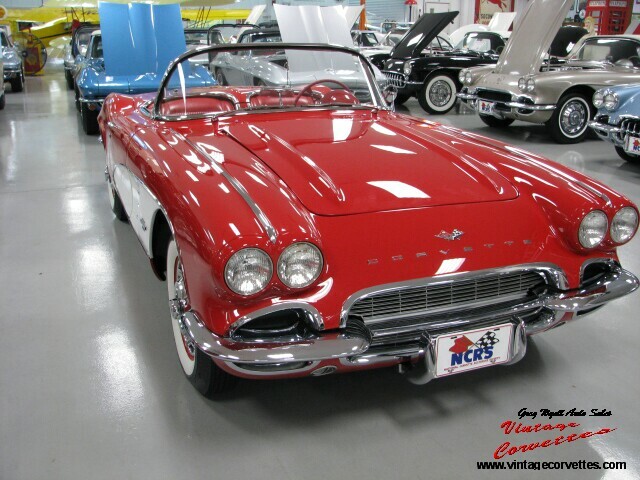 ONE OF THE BEST 57 CONVERTIBLES ON THE MARKET TODAY. PREVIOUSLY OWNED BY DAVIS LOVE PRO GOLF PLAYER. 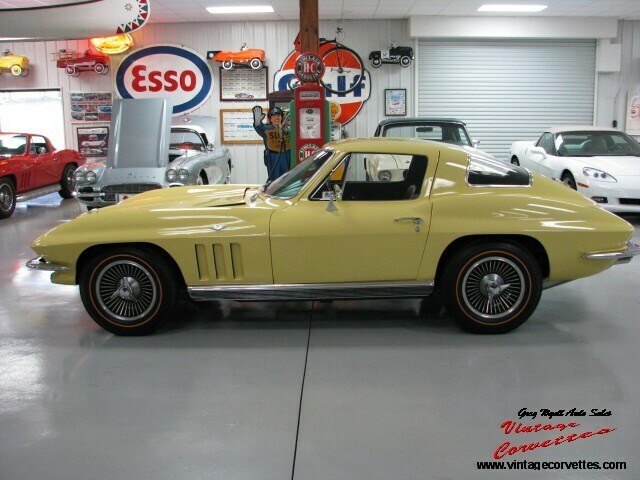 SALE OR TRADE FOR EARLY CORVETTE. 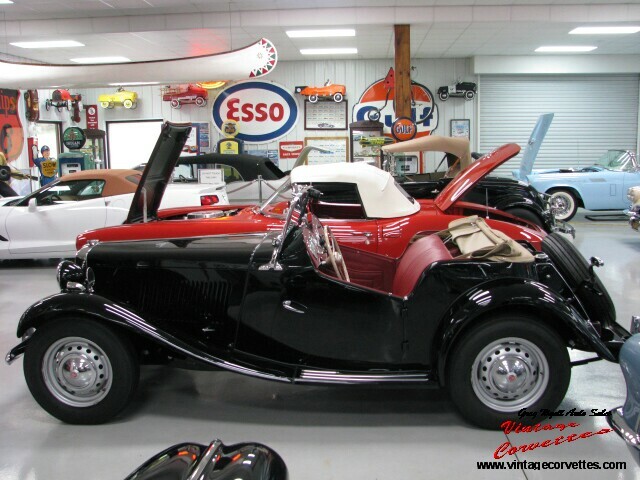 1952 MG MIDGET TD – BLACK / RED INTERIOR AACA SENIOR WINNER 2012!- JUST IN!! 1952 MG Midget TD. 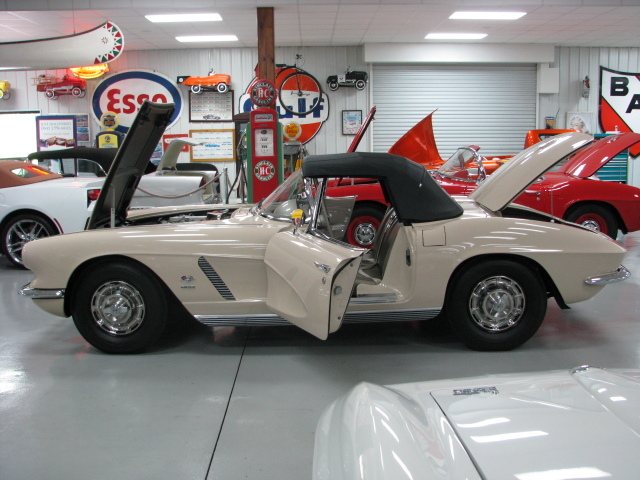 Black, Red Interior, Tan soft Top, Complete Frame off Restoration to Show Condition, AACA Senior Winner 2012 – New England MG “T” Register, Runs and Drives as New. The best 1952 MG offered for sale today! BILL ELLIOTT RACE CAR – JUST IN!! RACED IN 2002 BY AWSOME BILL ELLIOTT! 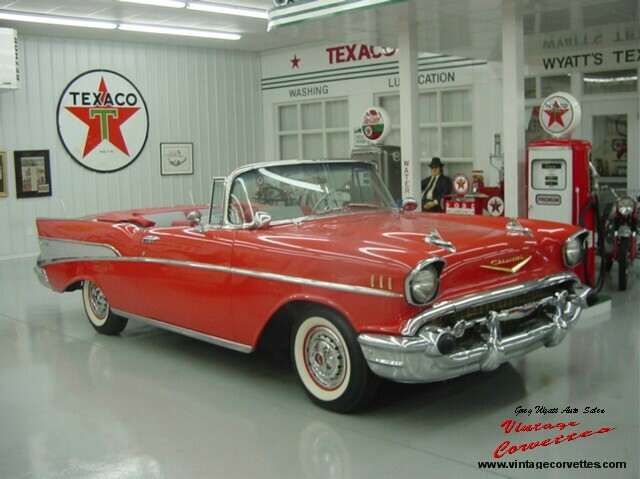 1956 CHEVROLET CONVERTIBLE BEL-AIR RESTO-ROD – Sold !! 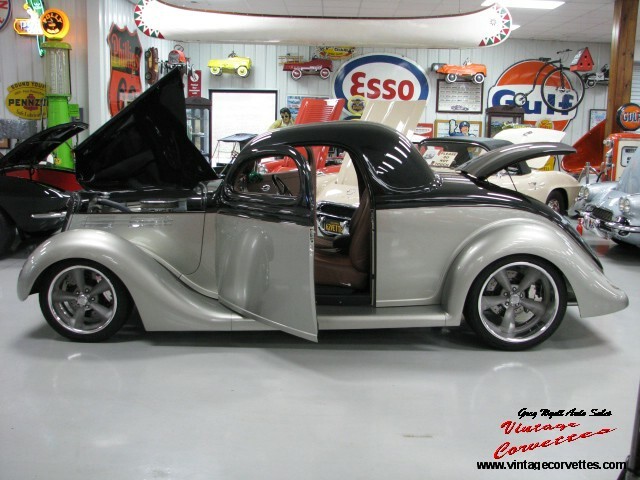 2008 / 1937 FORD COUPE / CONVERTIBLE STREET ROD – !SOLD! TANGERINE KANDY OVER SILVER WITH OUTSTANDING GRAPHICS. WILDROD BODY AND CHASSIS, AUTOMATIC WITH AIR, SUICIDE DOORS, POWER STEERING, POWER BRAKES, 383 STOKER SMALL BLOCK, POLISHED ALUMINUM HEADS, 440 HP, GRIFFIN RADIATOR, WILWOOD DISC BRAKES, 4 – WHEEL AIR RIDE TECHNOLOGIES SUSPENSION, BONE COLOR TEA’S BUCKET SEATS, BILLET SPECIALTIES “REBEL” WHEELS AND POLISHED IDIDIT TILT STEERING COLUMN. REMOVABLE HARD TOP. 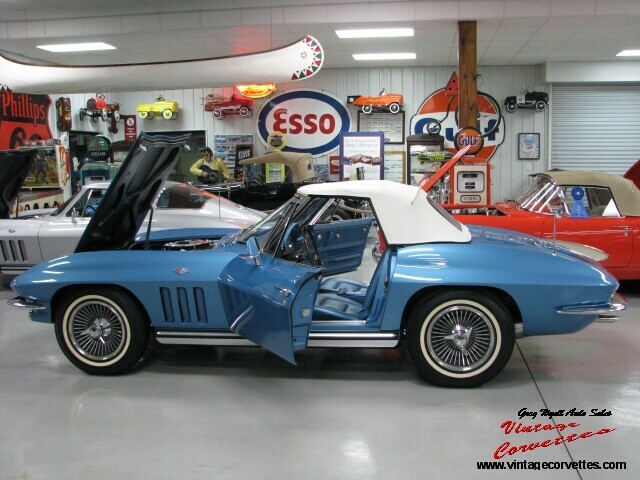 1967 CORVETTE Marina Blue , CONVERTIBLE – 400 HP – ” SOLD ” ! 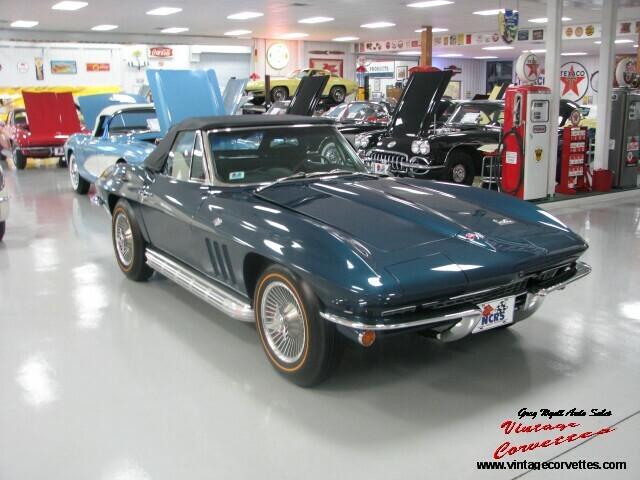 1965 CORVETTE – NASSAU BLUE-BLUE INTERIOR – 327-365HP / READY FOR JUDGING – “Sold” ! 3 Time AACA National Award Winner – Just In! 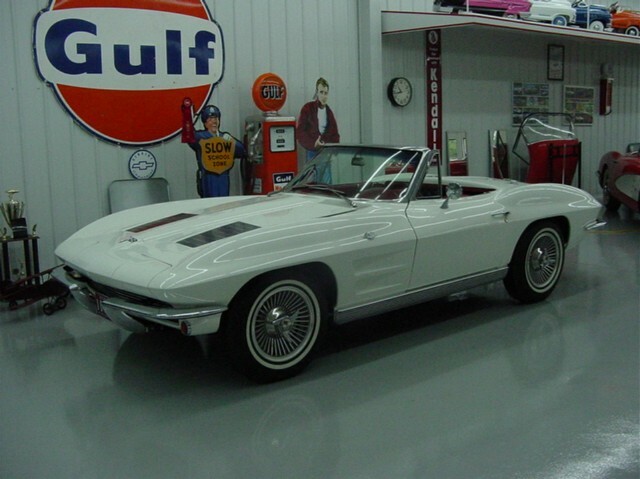 Original Ermine White paint with Red interior and only 49,000 original miles. All correct original matching numbers 283-250HP / 3 speed. Purchased from the original owner in 2010. 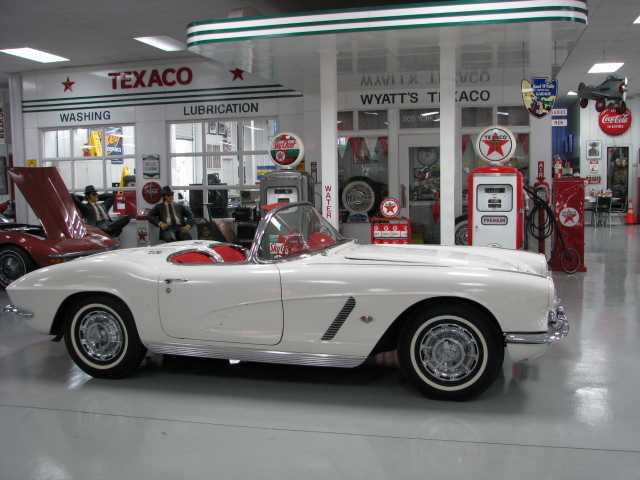 This is the 29th 1962 Corvette produced on Thursday, August 17, 1961 and delivered new to Ron Tonklin Chevrolet in Portland, OR. This car is a true well preserved “SURVIVOR”. 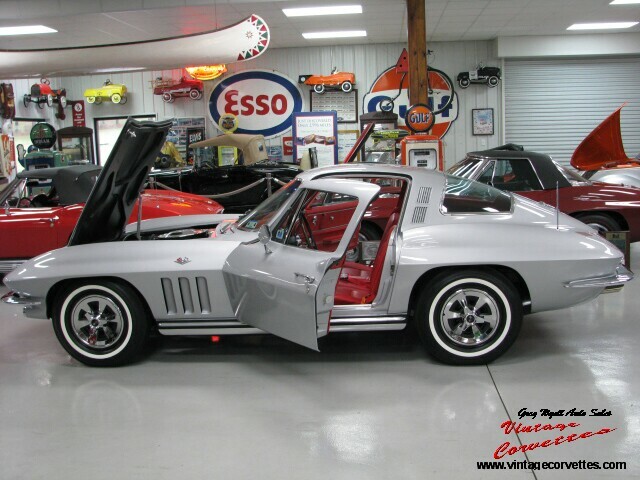 All original including paint, chrome, interior, and running gear. NCRS second flight and NCRS 4 Star Bowtie in 2014. 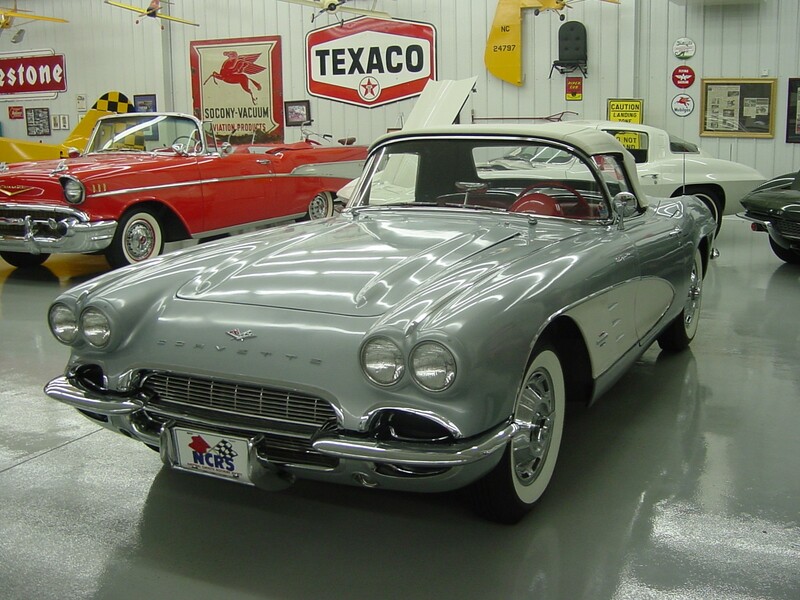 According to the NCRS, there have been only 12 Corvettes from the 1962 model year to have ever won a 4 Star Bowtie Award. 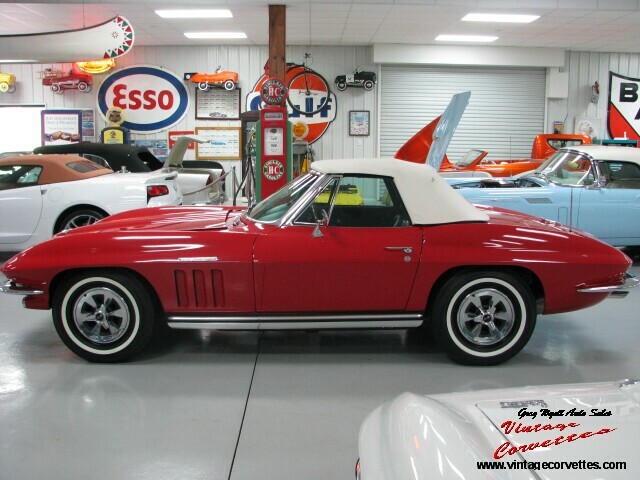 1967 CORVETTE CONVERTIBLE RALLY RED 427- 400HP TOP FLIGHT- SOLD!! RALLY RED WITH RED VINYL INTERIOR. 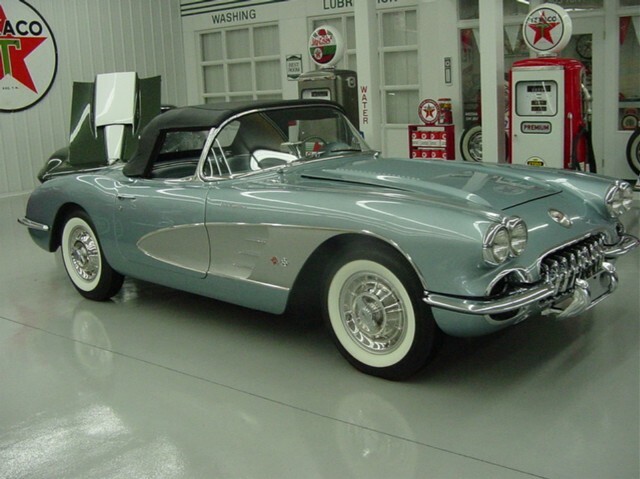 33,362 ORIGINAL DOCUMENTED MILES WITH ALL CORRECT ORIGINAL 427 – 400 HP / 4-SPEED (CL RATIO) TRANSMISSION. TELESCOPIC STEERING WHEEL, AM/FM RADIO, SHOULDER HARNESS, SIDE DUAL EXHAUST AND POSI REAR (370R). COMPLETE RESTORATION TO SHOW CONDITION, NCRS TOP-FLIGHT (2011), NCRS DOCUMENT VALIDATION, SHIPPING DATE REPORT AND REAL TANK STICKER STILL ON TANK. REAL RED ON RED CONVERTIBLE 1967 400 HP CAR. 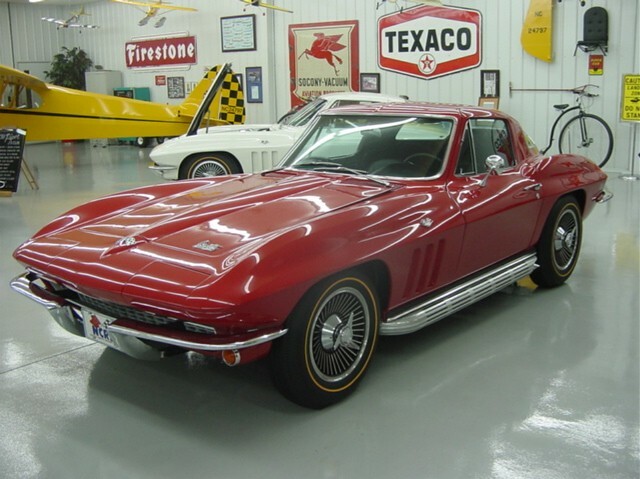 SOME OWNER HISTORY, ONE OF THE BEST WITH LOW ORIGINAL MILES! 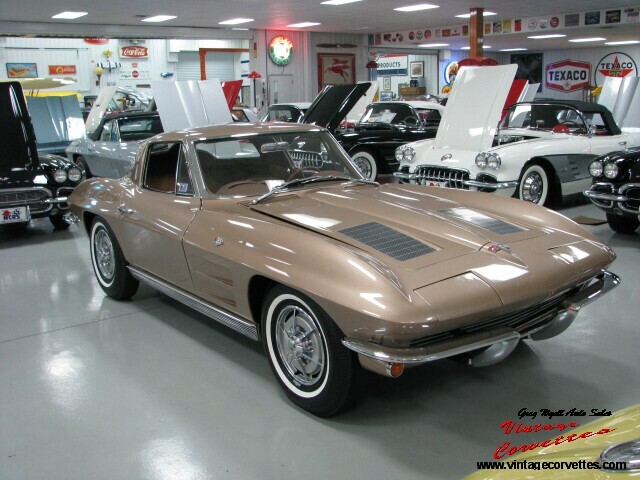 1963 CORVETTE SPLIT WINDOW COUPE SADDLE TAN 327-300HP- SOLD!! SADDLE TAN WITH SADDLE INTERIOR. WELL DOCUMENTED WITH THE ORIGINAL WINDOW STICKER AND ALL CORRECT MATCHING NUMBERS. 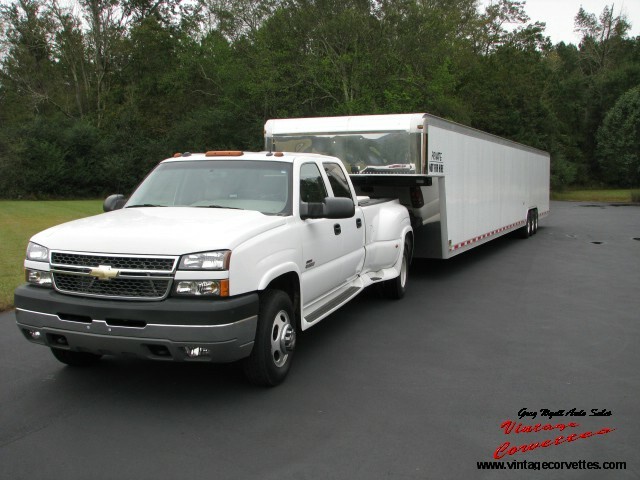 L75 / 327 – 300 HP WITH POWERGLIDE TRANSMISSION, 336 POSITRACTION REAR END, POWER STEERING, POWER BRAKES, METALLIC BRAKES, POWER WINDOWS, SIGNAL SEEK RADIO, AND WHITE WALL TIRES. COMPLETELY RESTORED TO SHOW CONDITION AND HAS WON 2 NCRS TOP FLIGHT AWARDS. ALL DOCUMENTS, AWARDS, AND JUDGING SHEETS COME WITH THE CAR. THIS IS A BEAUTIFUL WELL DOCUMENTED AND METICULOUSLY MAINTAINED RARE SADDLE TAN 1963 SPLIT WINDOW COUPE WITH 2 NCRS TOP FLIGHT AWARDS. THIS CAR IS A JOY TO DRIVE! IT LOOKS, RUNS, AND DRIVES AS NEW! 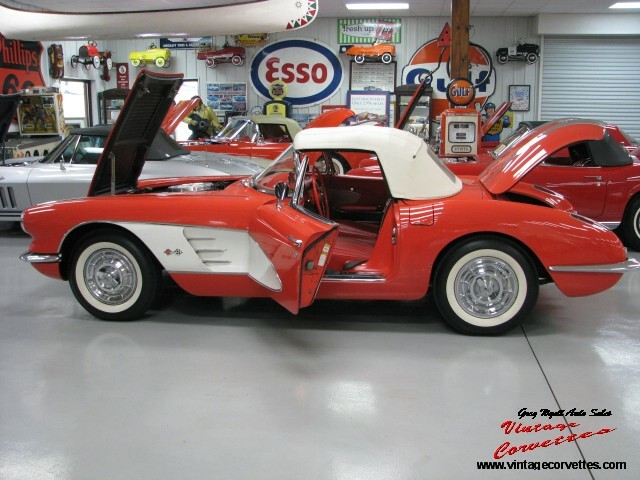 1961 CORVETTE – RED / RED WHITE COVE- 283-230HP AUTOMATIC MULTIPLE AWARDS INCLUDING TOP FLIGHT- SOLD!! 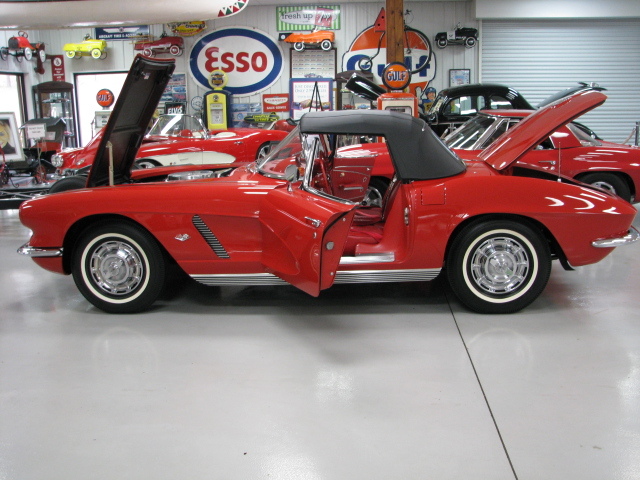 1961 Corvette Red / Red Interior, White Cove and Soft Top, All Original Correct Numbers Matching 283-230 HP, Automatic Transmission, Radio, Heater, Washer System, Complete Show Condition Frame Off Restoration, NCRS Top Flight, And Other Show Winners, Runs and Drives As New, The Best 1961 Automatic Corvettes Offered for Sale Today! Also Have Restoration Photo’s and Receipts. 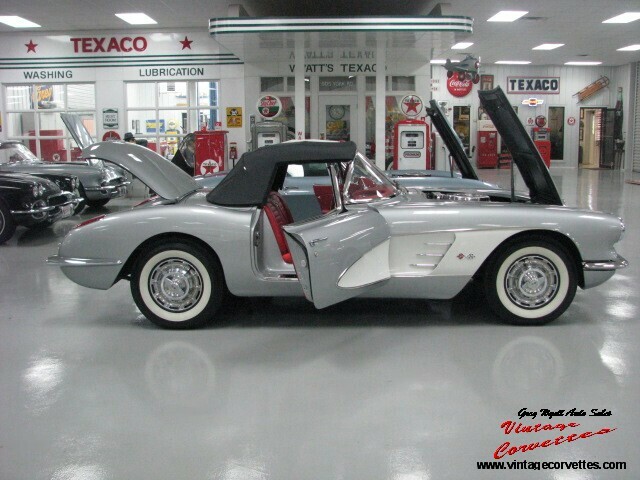 1965 CORVETTE COUPE SILVER PEARL RARE 396/425HP- SOLD!! 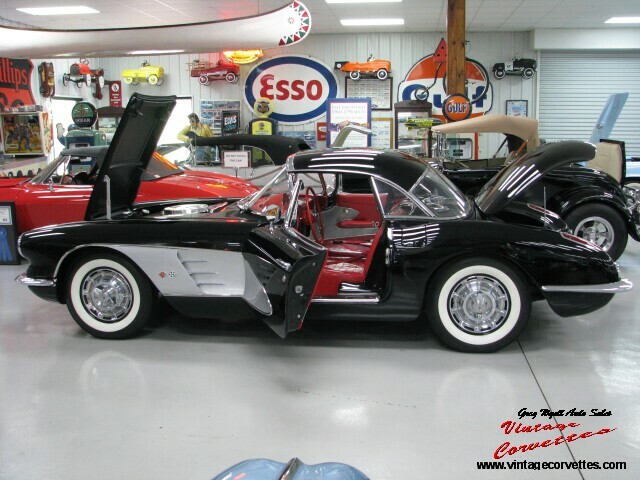 Silver Pearl with Black Vinyl interior and 56,962 acual miles. All correct original matching numbers L-78 396/425 HP, 4-Speed. 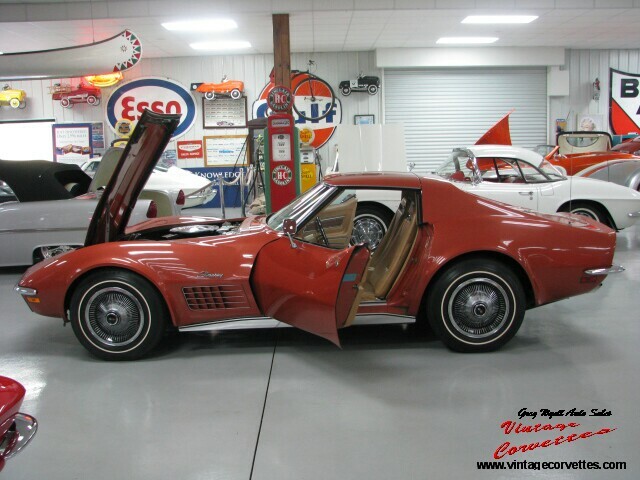 The only year for 396 engines in a Corvette and one of only 2,157 produced in 1965 with a 396/425 engine option. Professionally restored to show condition. 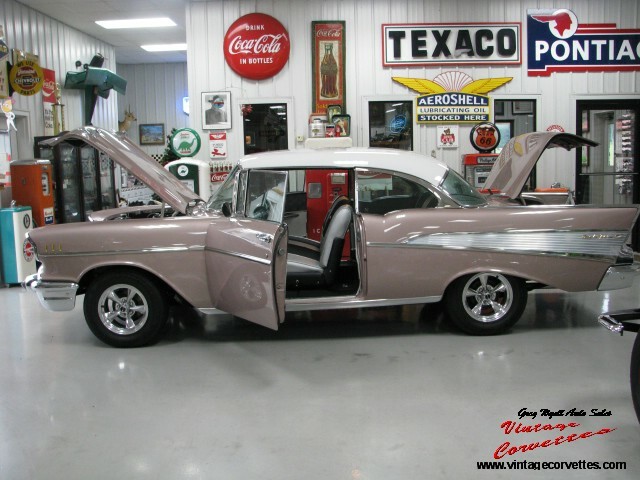 Options include factory side exhaust, knock off wheels, whitewall tires, teak wood stearing wheel, power antenna, transistorized ignition, 3.70 posi rear end, SS brakes, AM/FM radio, comfort/convenience group, back up lamps, day/night mirror, and tinted glass. Well documented with copies of the original window sticker, warranty and maintenance receipts, original owners manual, warranty book / POP, original plastic pouch, operating instructions, ownership history, NCRS shipping data report, and pages of a complete number breakdown of the entire car in a neatly arranged binder. 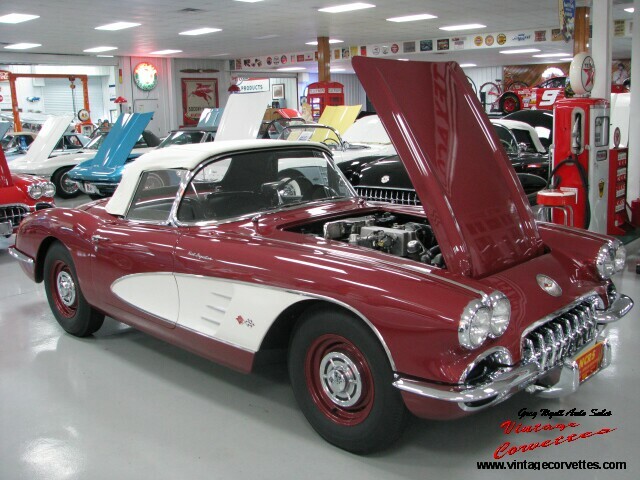 Looks, runs, and drives excellent, One of the best and rare 1965-396 cars offered for sale today! 1964 FORD GALAXIE 500 BLACK / BLACK- SOLD!! 1964 Ford Galaxie 500 2-Door, Hard Top, Black, Black Interior, 390 Block 428 Bore, 1/2 Inch Stroker Kit 460 CI, FE Engine, Detroit Locker 459 Gear, Trimic 5 Speed, Complete Frame Off Restored to Show Condition, Rust Free Body And Frame. 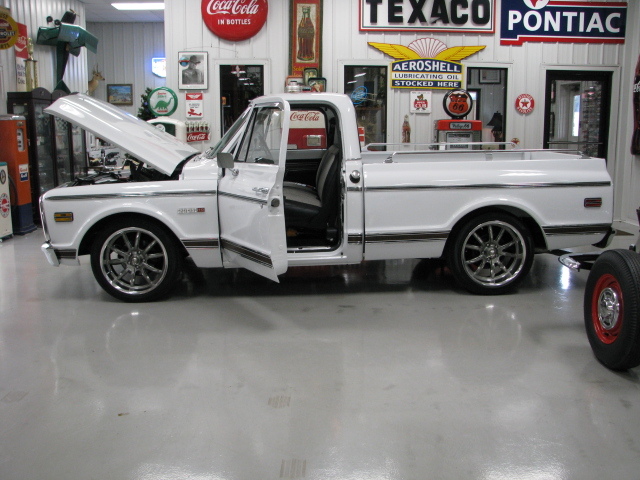 One of the Best 64 Fords Offered for Sale Today! 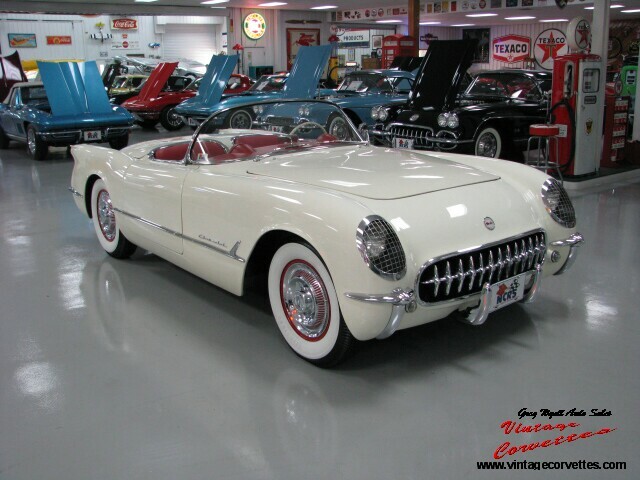 1957 CORVETTE POLO WHITE/RED 283/245HP- SOLD!! POLO WHITE WITH SILVER COVES, RED INTERIOR, MATCHING HARD TOP AND WHITE SOFT TOP. ALL CORRECT NUMBERS MATCHING 283 / 245 HP, 3 SPEED / 3.70 REAR AXLE, HEATER, SIGNAL SEEKING RADIO, COURTESY LIGHT, AND PARKING BRAKE ALARM. 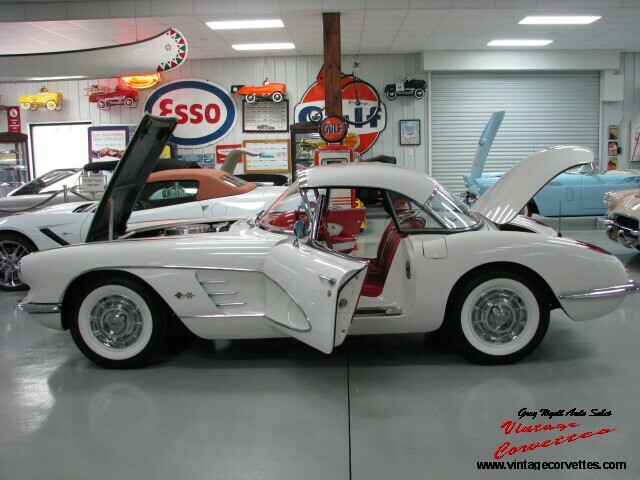 THIS IS A VERY EARLY PRODUCTION 1957 CORVETTE. IT IS VIN #251 AND WAS BUILT ON THURSDAY, OCTOBER 4, 1956. CAR HAS 54,500 MILES ON IT AND HAS UNDERGONE A COMPLETE NO EXPENSE SPARED, FRAME – OFF RESTORATION. TO SUPER SHOW CONDITION BY AN NCRS JUDGE. IT IS BEAUTIFUL AND READY FOR JUDGING! RESTORATION PICTURES COME WITH THE CAR. EXCELLENT NO-HIT STRAIT BODY AND FRAME. LOOKS, RUNS, AND DRIVES NEW! 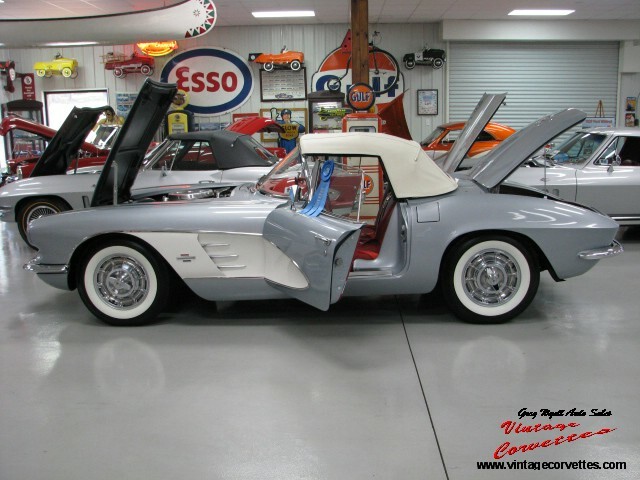 THIS CAR IS ONE OF THE BEST 1957 CORVETTES OFFERED FOR SALE TODAY! 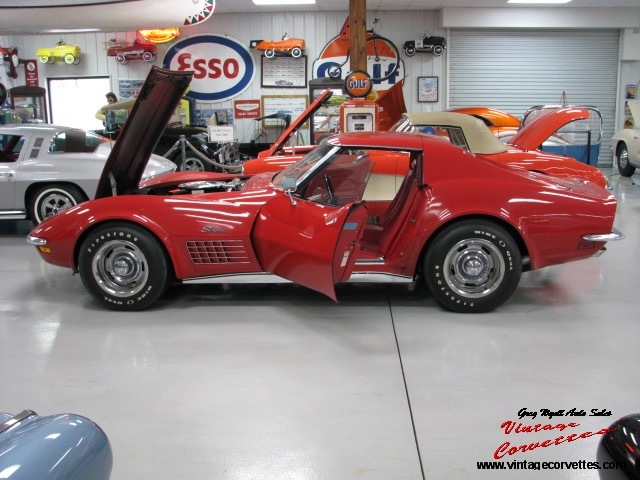 1965 CORVETTE CONVERTIBLE 350 HP – RALLY RED – SOLD!!! RALLY RED WITH RED VINYL INTERIOR AND BLACK SOFT-TOP. 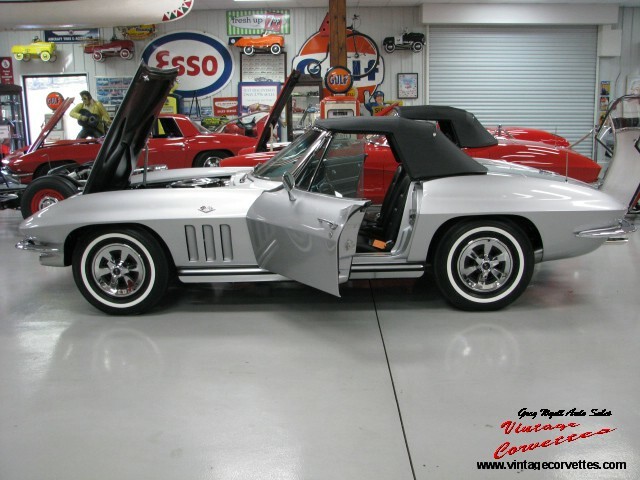 ALL CORRECT MATCHING NUMBERS 327 – 350 HP / 4 – SPEED WITH POSI REAR, POWER STEERING, POWER BRAKES, TINTED GLASS, KNOCK-OFF WHEELS, RADIO AND HEATER. COMPLETE PROFESSIONAL FRAME OFF RESTORED TO SUPER SHOW CONDITION. NCRS SPEC’S. 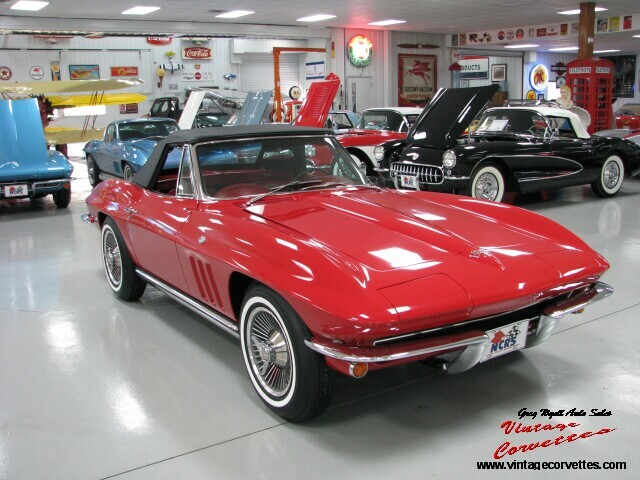 ONE OF THE BEST 65 CONVERTIBLE RED ON RED! 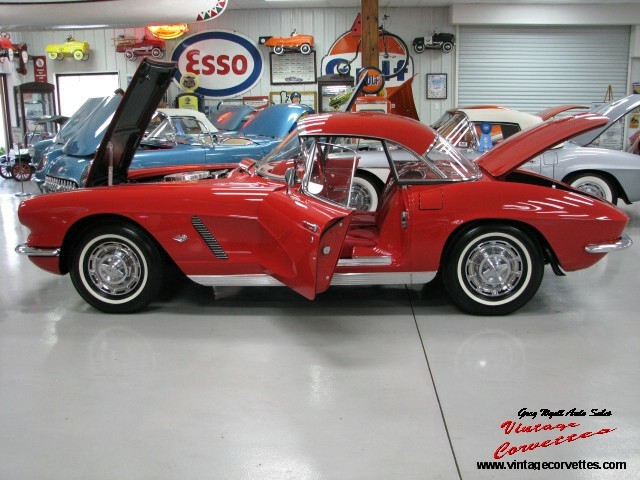 1960 BIG BRAKE FUELLY CORVETTE MAROON TOP FLIGHT – SOLD!! HONDURAS MAROON WITH BLACK INTERIOR, WHITE COVE AND SOFT – TOP. 283 – 290 HP FUELLY / 4 – SPEED. BOTH TOPS. 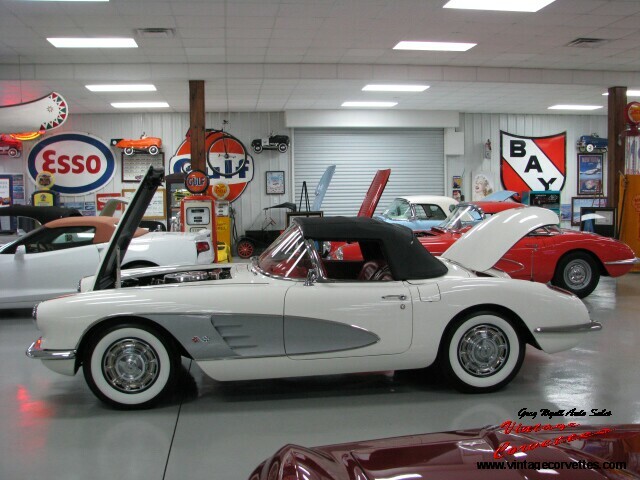 COMPLETE PROFESSIONAL BODY – OFF RESTORATION ON A NO HIT BODY ORIGINAL SOUTHERN CAR. 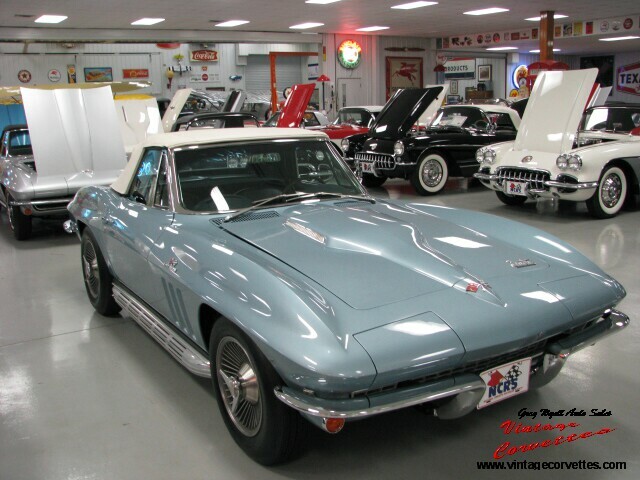 FOA 101 HEATER,FOA 102 RADIO,FOA 109 WINDSHIELD WASHERS,FOA 121 FAN DRIVE EQUIPMENT,FOA/RPO 261 SUNSHADES,RPO 419 HARD TOP,RPO 283 290 HP,RPO 579 FUEL INJECTION,RPO 675 LIMITED-SLIP REAR AXLE,RPO 685 FOUR-SPEED TRANSMISSION,RPO 87 HEAVY DUTY BRAKES & SPECIAL STEERING EQUIPMENT (ONE OF 119 BUILT IN 1960),FOA-FACTORY OPTIONAL ACCESSORIES,RPO-REGULAR PRODUCTION ORDER. 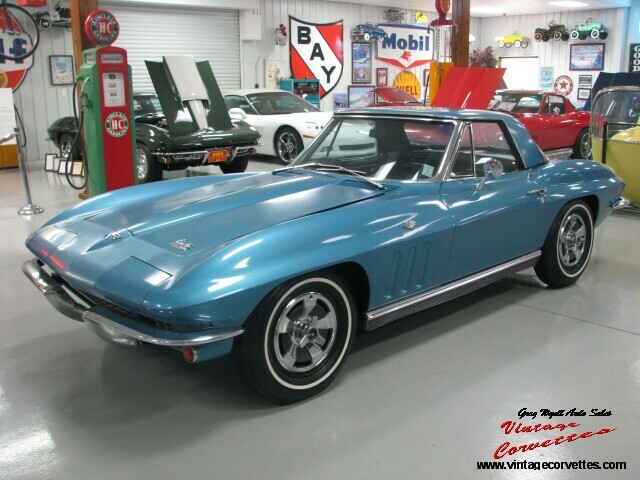 1966 CORVETTE TROPHY BLUE 427-390HP FACTORY AIR- SOLD!! 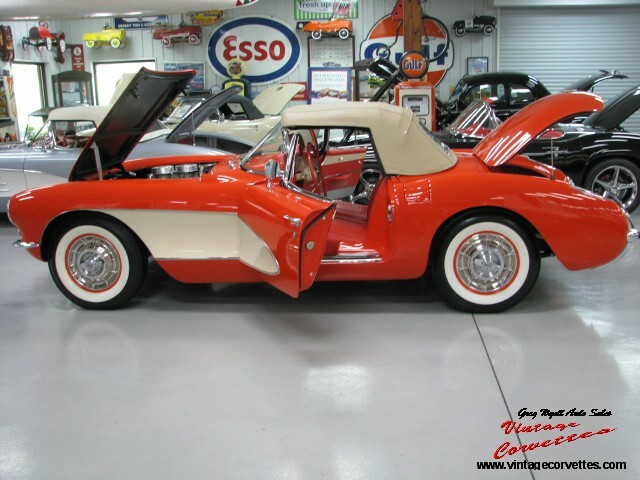 Complete No Expense Spared Nut and Bolt Frame Off Restoration to Super Show Condition, One of the BEst 66 Factory Air Convertibles Offered for Sale Today.. 66 427-390 Factory Air Car with Great Colors and Options, Ready for NCRS Judging. 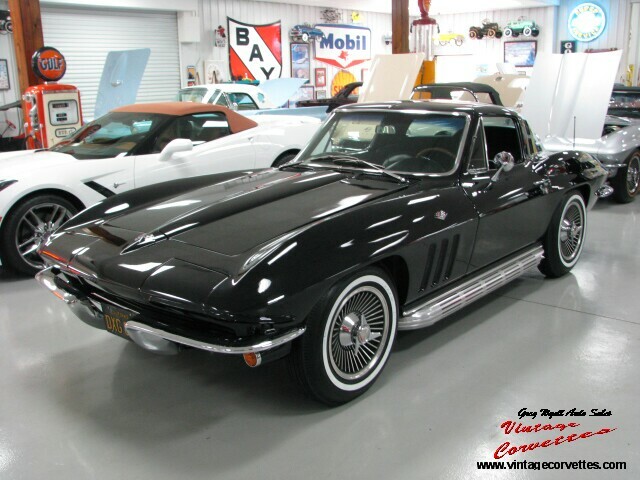 1965 CORVETTE COUPE BLACK/BLACK RARE 365HP WITH AIR- SOLD!! 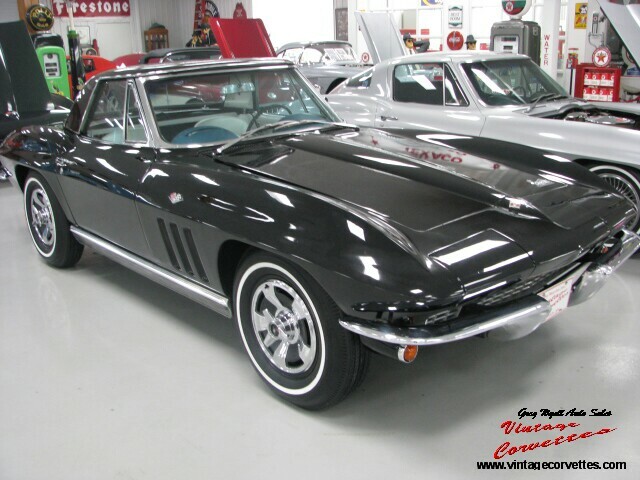 Extremely rare and documented California 1965 Corvette Black with Black vinyl interior, all correct original numbers matching L-76, 327/365HP engine that was recently rebuilt by a professional GM technician, 4 speed with air conditioning. 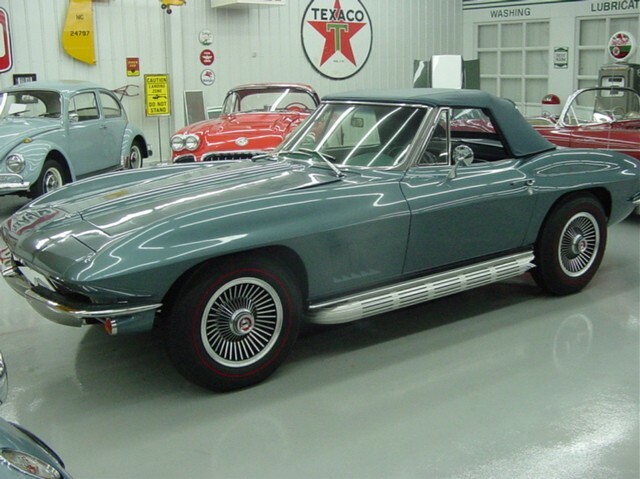 This Corvette was built on July 26, 1965 during the last week of 1965 production. 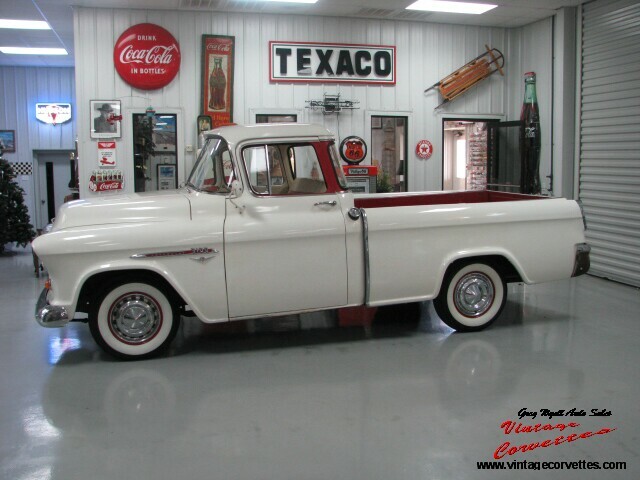 It was delivered new to Madera, California where it was purchased new on August 5, 1965. 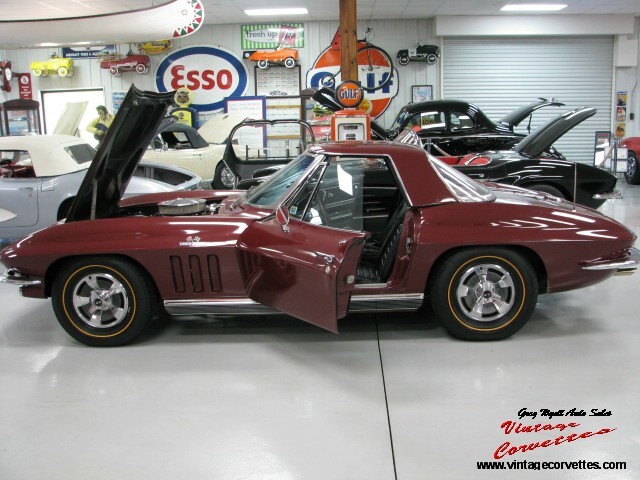 Now restored to show condition and one of only 227 cars with the following options: L-76 327/365HP, 4 speed, air conditioning, power brakes, power windows, power antenna, factory side exhaust, knock off wheels, WW tires, teakwood wheel, 3.08 posi rear end, SS brakes, AM/FM radio, comfort / convenience group, day/night mirror, and back up lamps. 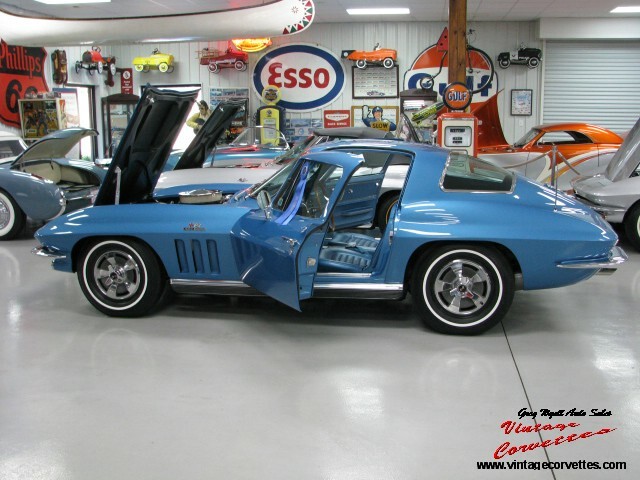 Well documented with 4 inch three ring binder that includes a complete number break down of the entire car, original owners manual and plastic pouch, warranty book /POP, NCRS shipping data report, numerous maintenance receipts, rstoration pictures, ownership history and milage documentation. 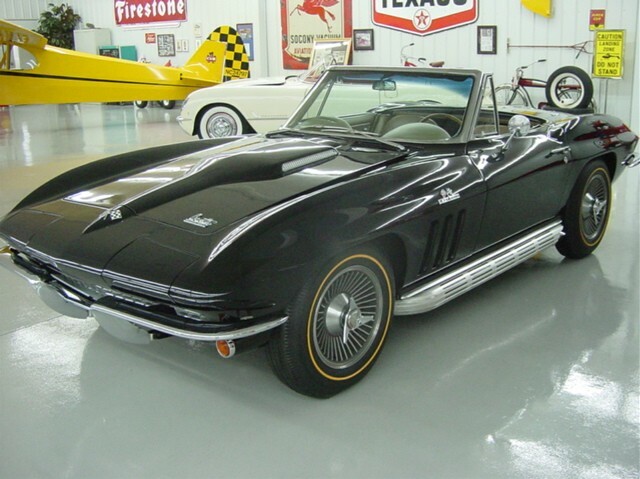 Looks, runs, and drives as new.Very rare and maybe the only real 1965 California black/black 365HP with air offered for sale today! 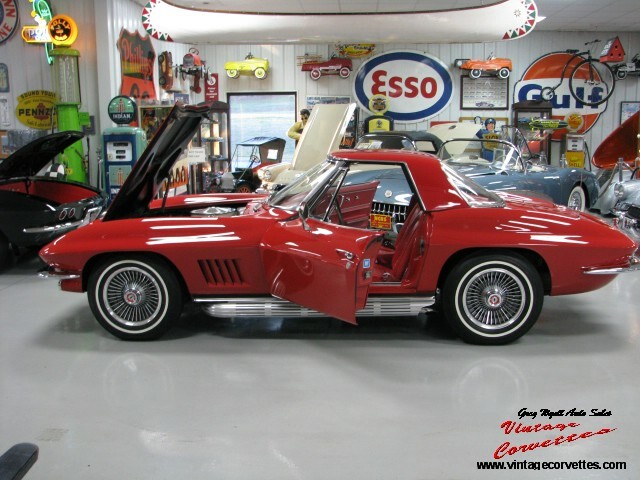 1964 CORVETTE COUPE -RED/BLACK RARE 365 HP WITH AIR-2 OWNER NCRS TOP FLIGHT- SOLD!! RIVERSIDE RED WITH BLACK INTERIOR. 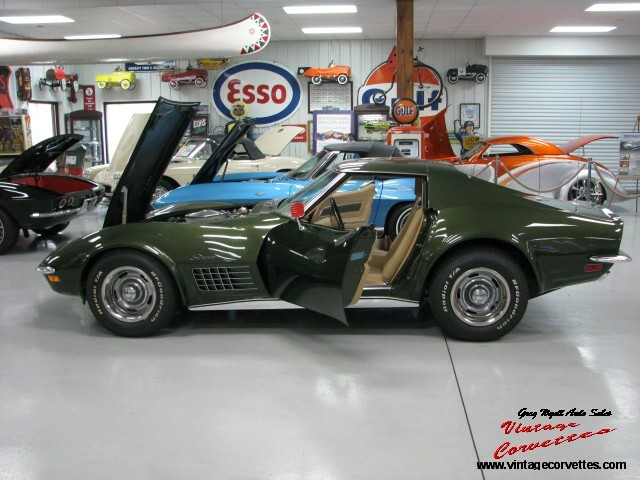 EXTREMELY RARE AND WELL DOCUMENTED ALL CORRECT MATCHING NUMBERS L76 / 327 – 365HP WITH FUNCTIONING FACTORY AIR CONDITIONING , M20 4 SPEED , POSITRACTION, AM FM RADIO, WW TIRES, AND TINTED GLASS. 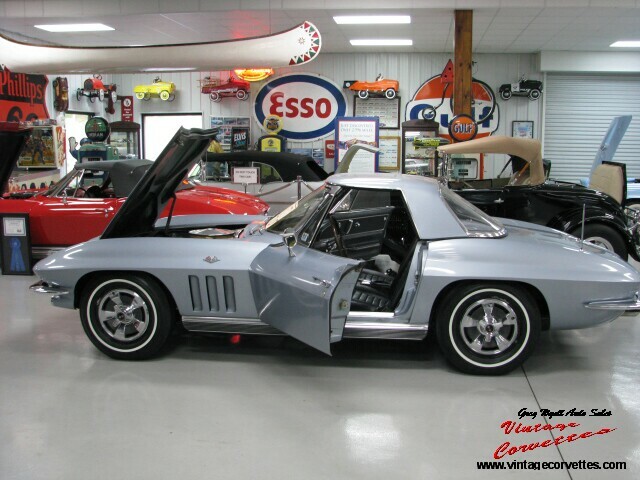 ONE OF ONLY 243 -1964 L76 COUPES WITH FACTORY AIR CONDITIONING. RESTORED TO SHOW CONDITION AND HAS WON NCRS TOP FLIGHT. WELL DOCUMENTED 2 OWNER CAR WITH ORIGINAL DEALER DOCUMENTS INCLUDING DEALER SALES RECIEPT, FINANCE CONTRACT, RADIO INSTRUCTIONS, WARRANTY, AND REGISTRATION. 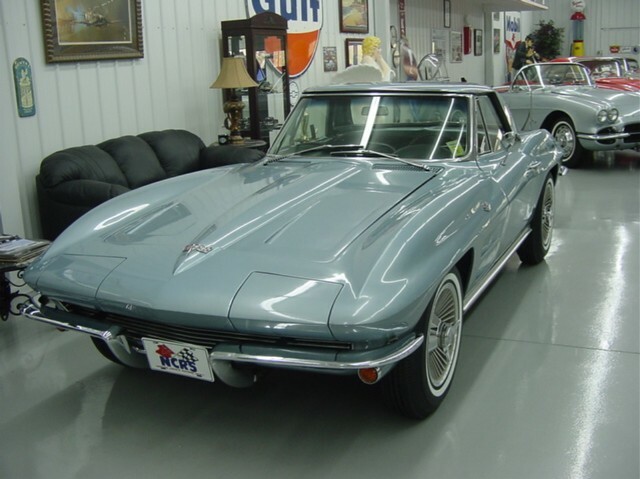 CAR COMES WITH NCRS SHIPPING DATA REPORT THAT SHOWS THE CAR WAS BUILT ON MAY 20, 1964 AND DELIVERED NEW TO QUEEN CITY CHEVROLET IN CINCINNATI, OH. 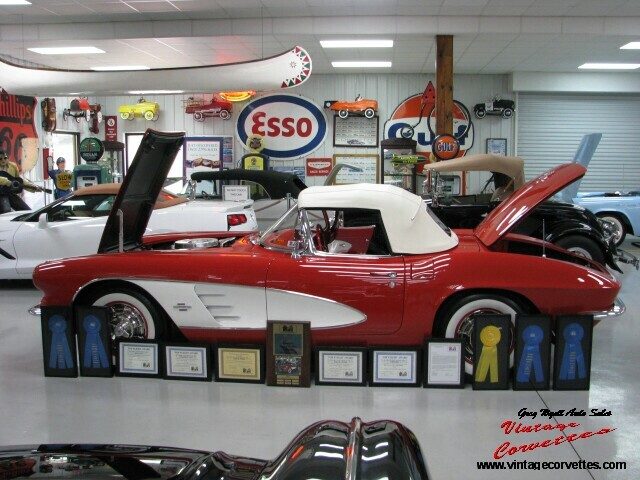 ALL ORIGINAL DOCUMENTS, SHIPPING DATA REPORT, AWARDS AND JUDGING SHEETS COME WITH THE CAR. BOTH A SET OF REPRODUCTION KNOCK OFF WHEELS AND THE ORIGINAL WHEELS AND HUB CABS ALSO COME WITH THE CAR. 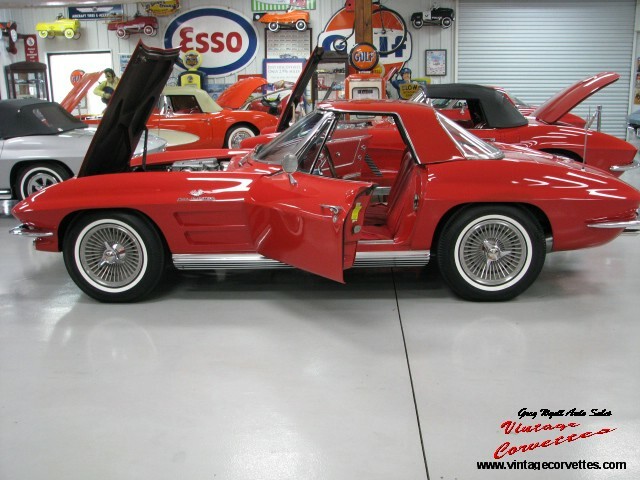 A BEAUTIFUL TOP FLIGHT RED COUPE THAT LOOKS AND RUNS AS NEW. 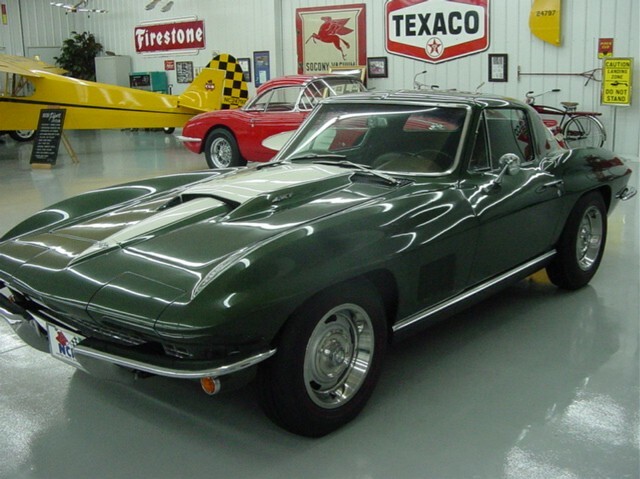 VERY RARE AND MAYBE THE BEST 1964 COUPE 365 HP WITH AIR CONDITIONING OFFERED FOR SALE TODAY! ERMINE WHITE WITH BLACK INTERIOR, SILVER COVE AND BLACK SOFT-TOP. 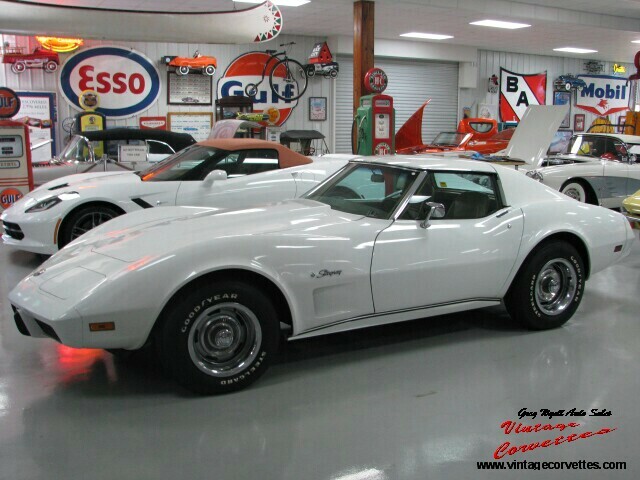 ALL CORRECT ORIGINAL 283 – 230 HP / 3 – SPEED WITH HEATER, RARE RADIO DELETE, WASHER SYSTEM AND WHITE WALL TIRES. COMPLETE FRAME-OFF RESTORED, NO HIT BODY AND EXCELLENT FRAME. NCRS TOP-FLIGHT, ORIGINAL SALES INVOICE FROM JOHNSON CHEVROLET (MAY 19, 1961). 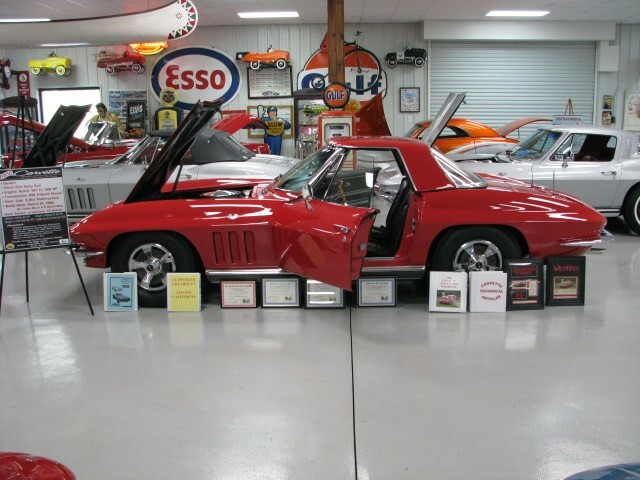 ALL GLOVE BOX PAPERWORK, ORIGINAL TITLE, SHOWROOM BROCHURE, ETC..RUNS AND DRIVES AS NEW! 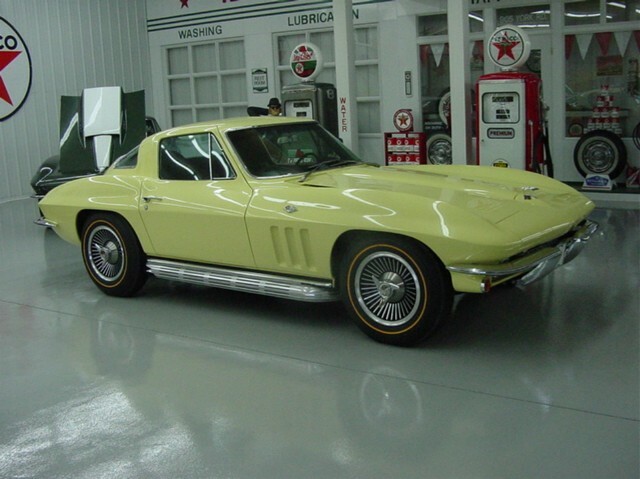 1966 CORVETTE – YELLOW CONVERTIBLE- SOLD!!! 1966 Corvette Convertible Yellow, Black Interior, Black Soft Top, All Correct Matching Numbers, 327-350 HP, 4 Speed, Posi Rear-end, Power Steering, Power Brakes, Tinted Glass, Knock Off Wheels, Firestone 775 Black Wall Tires, Very Complete Professional Frame Off Restoration to Super Show Condition meeting NCRS Spec’s, One of the Best 66 350HP Convertibles Available for Sale Today! Ready for Judging. 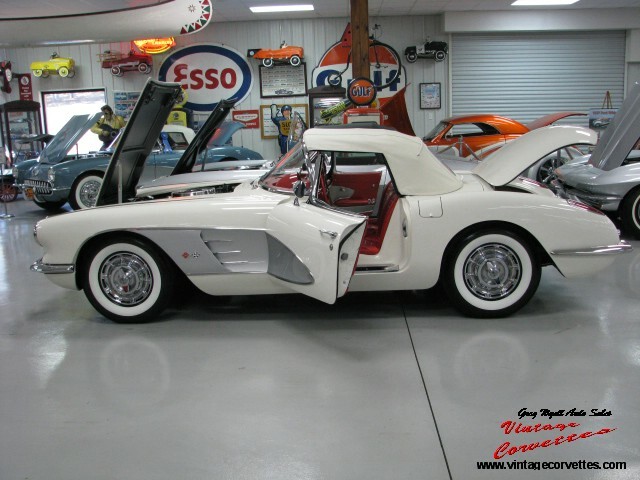 1960 CORVETTE ERMINE WHITE WITH 21,651 ORIGINAL MILES -SOLD!!! ERMINE WHITE WITH RED INTERIOR AND SILVER COVE. CORRECT NUMBERS MATCHING 283 – 230 HP / 3 – SPEED. ALL ORIGINAL NO-HIT CAR WITH ONE LACQUER REPAINT. JACK, SPARE TIRE AND TRUNK TOOLS, COURTESY LIGHT, WASHER SYSTEM WITH HARD-TOP ONLY. 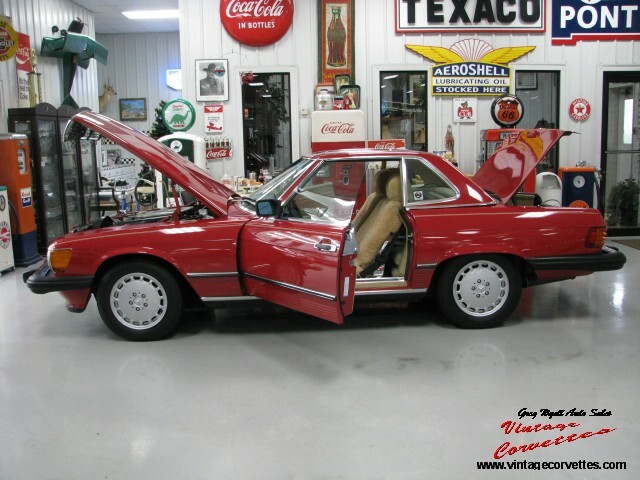 VERY NICE ORIGINAL DOCUMENTED 21,631 MILE CAR THAT RUNS AND DRIVES GREAT! SOME OWNER HISTORY AND RESTORATION RECEIPTS. 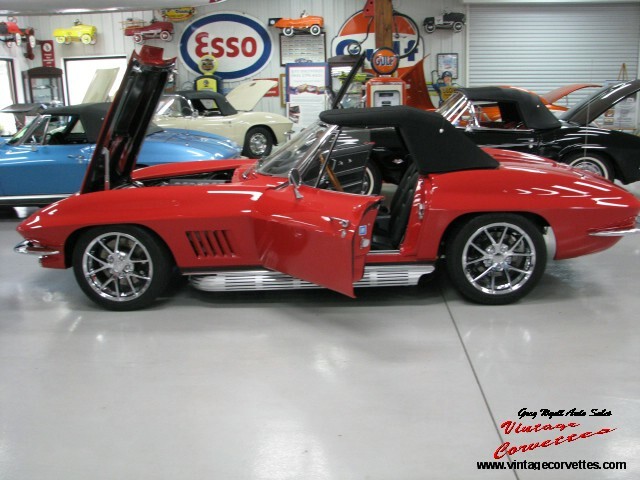 1966 CORVETTE CONVERTIBLE “SURVIVOR” MOSPORT GREEN – SOLD!!! MOSPORT GREEN WITH BLACK INTERIOR. 327 – 350 HP / 4 – SPEED WITH BOTH TOPS, SIDE MOUNT EXHAUST, AM-FM RADIO, HEATER, POWER ANTENNA AND GOLD LINE TIRES. 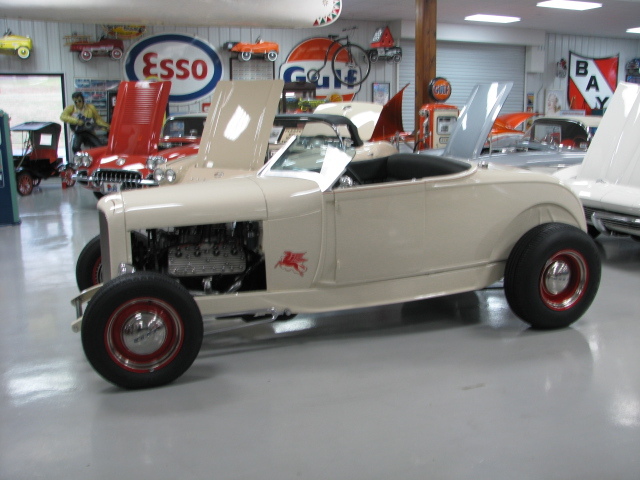 39K ORIGINAL DOCUMENTED MILES, ORIGINAL PAINT, INTERIOR AND SOFT-TOP. ORIGINAL SALES LOAN DOCUMENT, PRO-TECTO PLATE AND ORIGINAL TITLE. NCRS TOP – FLIGHT THAT RUNS AND DRIVES LIKE NEW! MAYBE THE BEST 66 ORIGINAL PAINT CAR IN EXISTENCE. 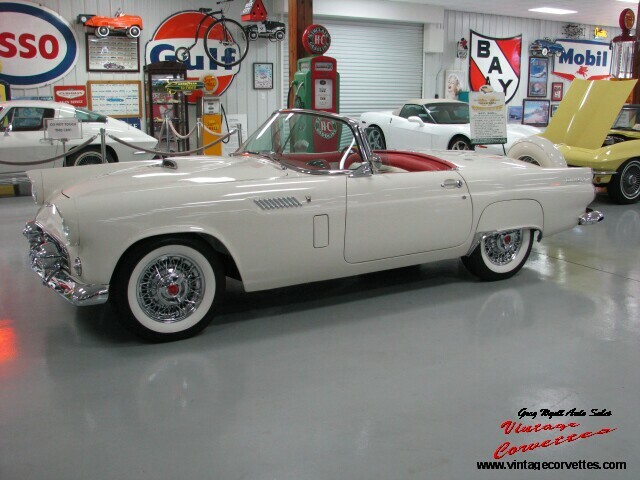 MUST SEE THIS CAR! 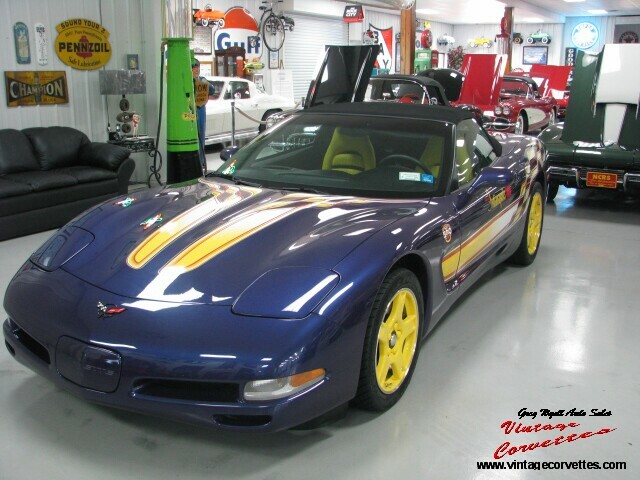 1998 CORVETTE PACE CAR – SOLD!!! 82ND INDIANAPOLIS 500, MAY 24, 1998 – PACE CAR. 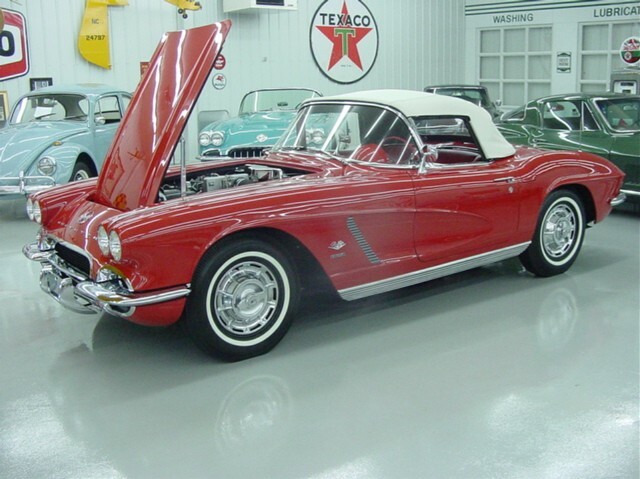 ALL ORIGINAL WITH ONLY 502 ORIGINAL MILES. SHOW CONDITION WITH ALL PAPERWORK FROM NEW. WINDOW STICKER, GLOVE BOX PAPERWORK AND LOADED WITH AUTOMATIC. ONE OF THE BEST OFFERED FOR SALE TODAY. NEW CAR! 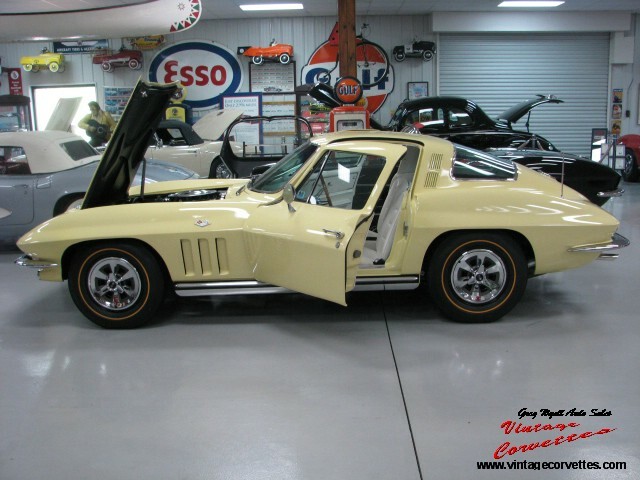 1966 CORVETTE COUPE – SUNFIRE YELLOW – RADIO DELETE – SOLD!! SUNFIRE YELLOW WITH BLACK VINYL INTERIOR. ALL CORRECT NUMBERS 327 – 300 HP / 4 – SPEED. 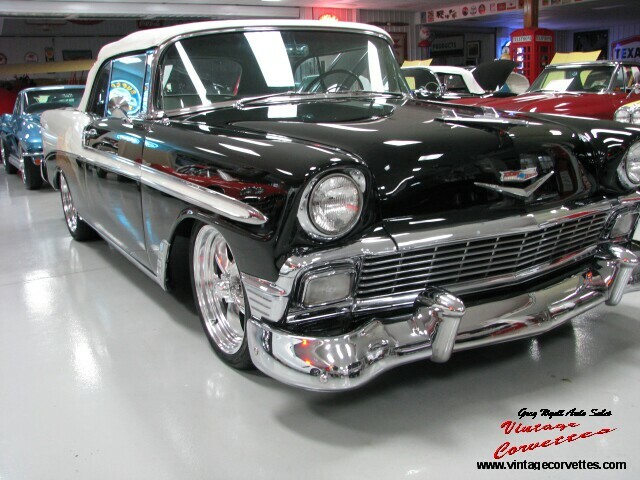 RADIO DELETE, TINTED GLASS, COMPLETE RESTORATION, LAQUER PAINT, SPARETIRE, JACK AND JACK TOOLS. 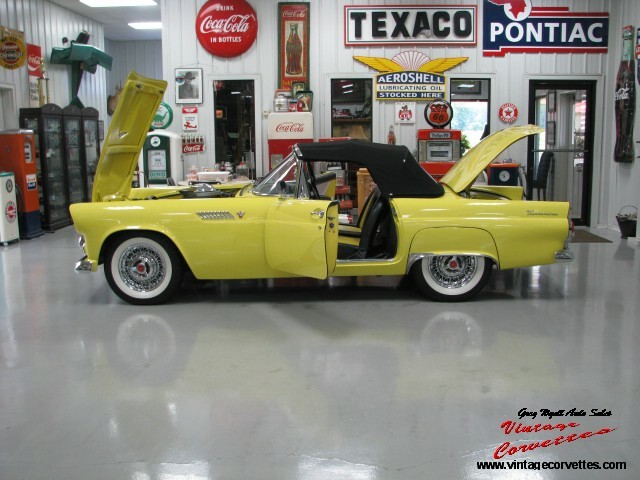 STRAIGHT BODY AND FRAME, VERY NICE 66 YELLOW COUPE WITH RARE RADIO DELETE. 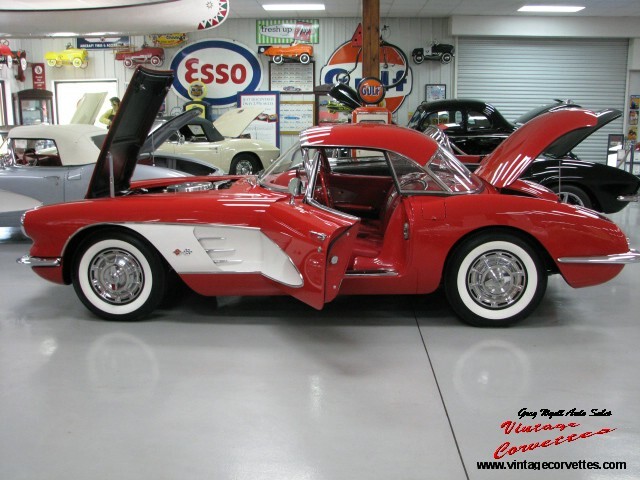 1958 CORVETTE – PANAMA YELLOW- NCRS TOP-FLIGHT – SOLD!! 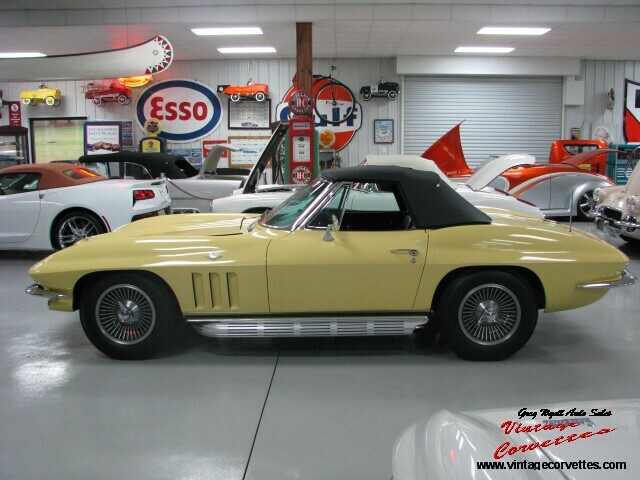 PANAMA YELLOW (ONE OF 455) WITH CHARCOAL INTERIOR, WHITE COVE AND SOFT-TOP. ALL CORRECT NUMBERS MATCHING 283 – 290 HP – FUEL INJECTED / 4 – SPEED. NCRS TOP FLIGHT (2010) AND PV AWARDS. BEST OF SHOW AWARD AT LAKE MILLER CLASSIC 2010 CONCOURS D’ELEGANCE. COMPLETE FRAME-OFF RESTORED TO SHOW CONDITION. STRAIGHT FRAME AND BODY. 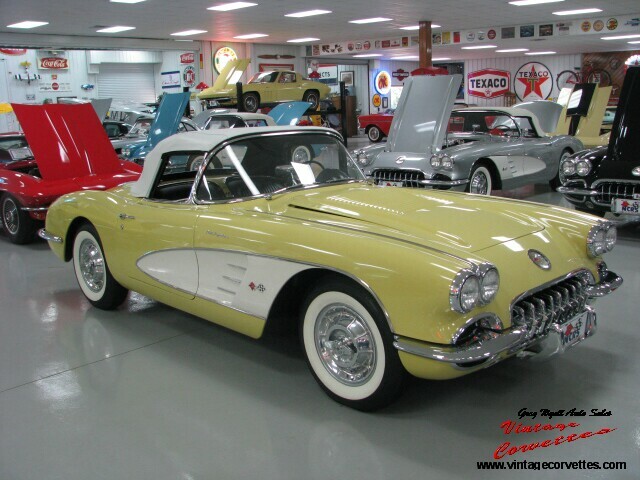 ONE OF THE BEST 1958 PANAMA YELLOW CORVETTES OFFERED FOR SALE TODAY! 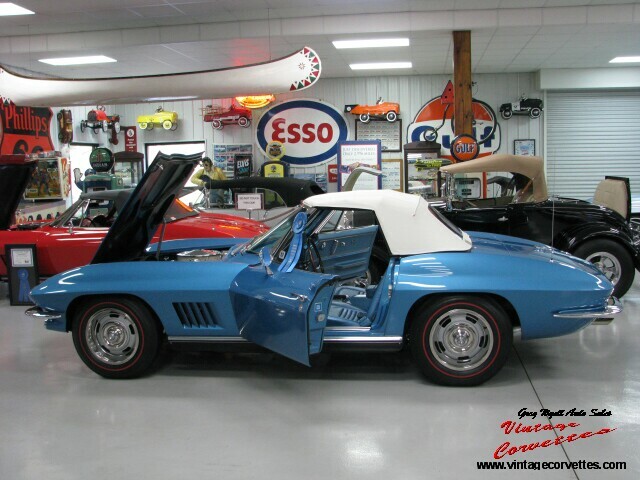 1966 CORVETTE CONVERTIBLE – LAGUNA BLUE – 327/350 HP – FRAME OFF RESTORED – SOLD!! 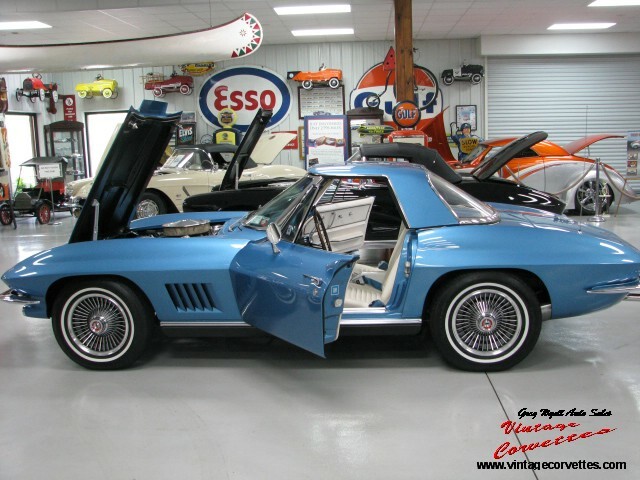 LAGUNA BLUE WITH BLACK INTERIOR AND BLACK SOFT-TOP ONLY. ALL MATCHING NUMBERS 327 – 350 HP / 4 – SPEED WITH POWER STEERING, AM/FM RADIO, HEATER, SUNSHADES, TEAKWOOD STEERING WHEEL, TINTED GLASS, SIDE MOUNT EXHAUST AND KNOCK-OFF WHEELS. COMPLETE PROFESSIONAL BODY OFF RESTORATION TO SHOW CONDITION. NCRS SHIPPING DATA REPORT, PICTURE OF ORIGINAL OWNER IN CAR AFTER PURCHASE & PARTIAL INSTALLMENT CONTRACT. 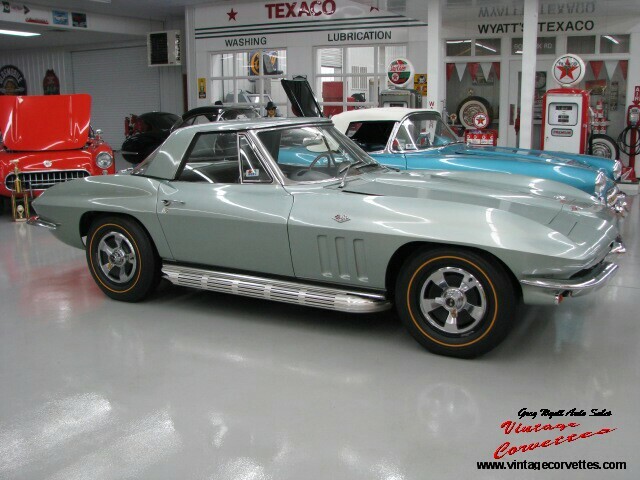 VERY NICE 66 WITH RARE COLOR 1 OF 2,054 CARS WITH THIS COLOR. 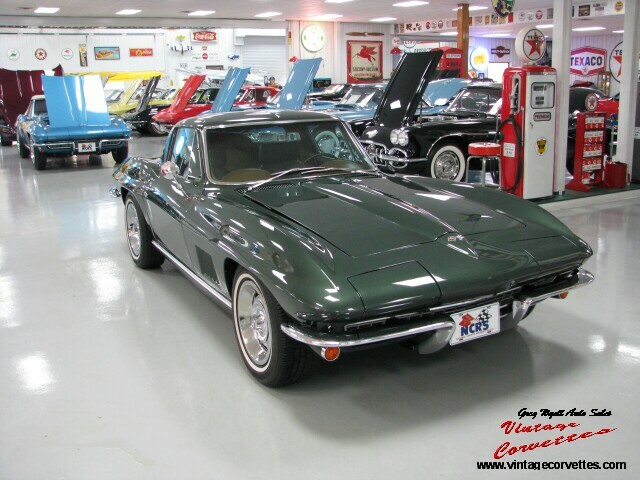 1967 CORVETTE COUPE – GOODWOOD GREEN – SOLD!! GOODWOOD GREEN WITH SADDLE INTERIOR. CORRECT NUMBERS 327 – 300 HP / AUTOMATIC WITH POWER STEERING, POWER BRAKES, TINTED GLASS, HEADREST SEATS AND RALLY WHEELS WITH RADIAL WHITE WALL TIRES. 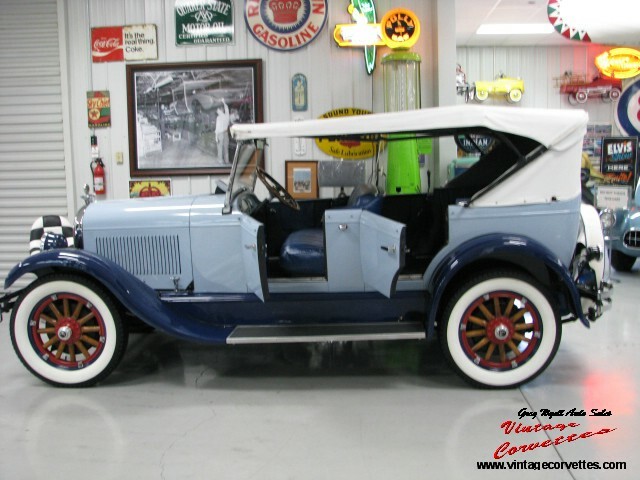 VINTAGE AIR CONDITIONING , COMPLETE BODY-OFF RESTORATION, CAR WITH SOME MILES SINCE RESTORATION. 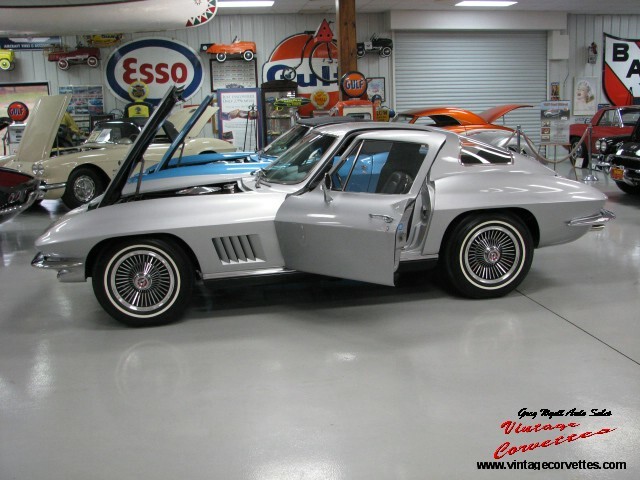 FULLY RESTORED CAR THAT RUNS AND DRIVES AS NEW! RPO – 684 ONE OF 142 CAR’S PRODUCED IN 1959. 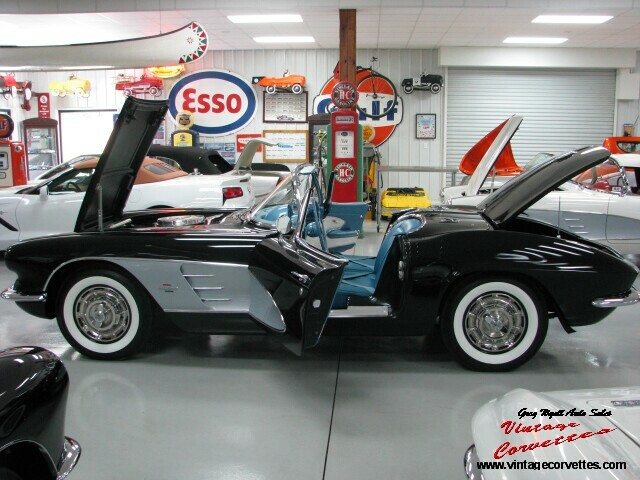 TUXEDO BLACK WITH BLACK INTERIOR AND BLACK HARD TOP ONLY. ALL CORRECT NUMBERS 283 – 270 HP / 4 – SPEED WITH POSI-REAR, SUNSHADES, COURTESY LIGHT, AM RADIO, HEAVY DUTY BRAKES AND SUSPENSION WITH BLACK WALL TIRES. 2 TIME NCRS TOP-FLIGHT CAR WITH NO EXPENSE SPARED PROFESSIONAL BODY-OFF RESTORATION TO SHOW CONDITION AND RESTORATION PHOTO’S. ONE OF THE BEST BIG BRAKE CARS OFFERED FOR SALE TODAY! 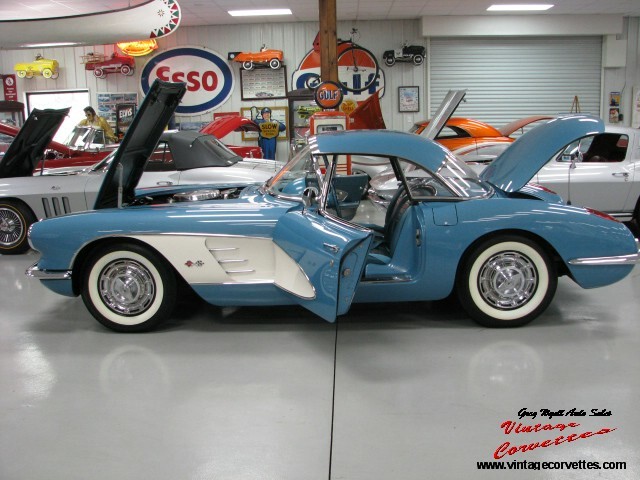 1954 CORVETTE – 2 OWNER – PENNANT BLUE – TOP-FLIGHT/DUNTOV – SOLD!! PENNANT BLUE WITH TAN INTERIOR AND TAN SOFT-TOP. ALL CORRECT NUMBERS AND DATES. 6 CYLINDER AUTOMATIC WITH WASHER SYSTEM, RADIO AND HEATER. COMPLETE FRAME OFF RESTORATION TO SHOW CONDITION. NCRS, 2 TIME TOP-FLIGHT (99.5) PV AND DUNTOV AWARDS. 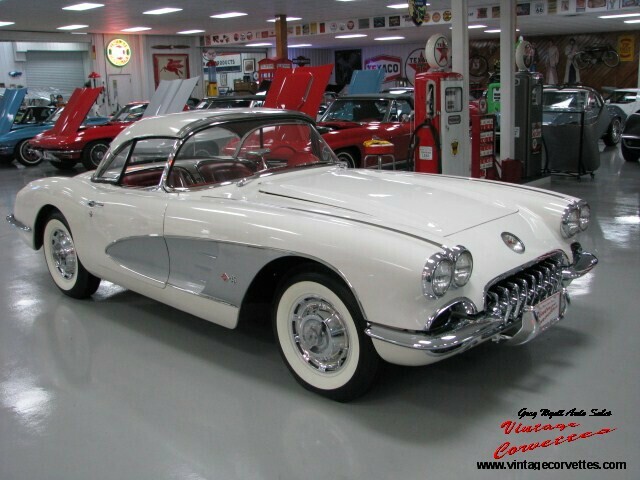 OWNER HISTORY BACK TO 1958 WITH NO HIT BODY, PERFECT FRAME, CORRECT JACK AND TOOLS, ORIGINAL OWNERS MANUAL AND GLOVE BOX PAPERWORK. CAR WAS USED TO PRODUCE THE DANBURY MINT DIE-CAST MODEL AND HAS MODEL WITH THE CAR. 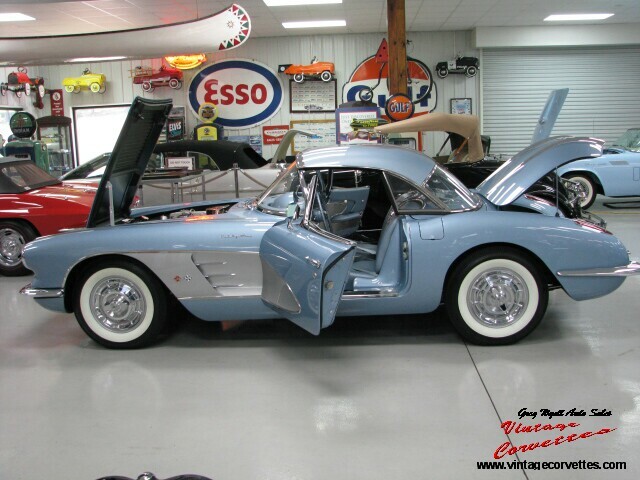 ONE OF THE BEST 54 DUNTOV CORVETTES OFFERED FOR SALE TODAY! 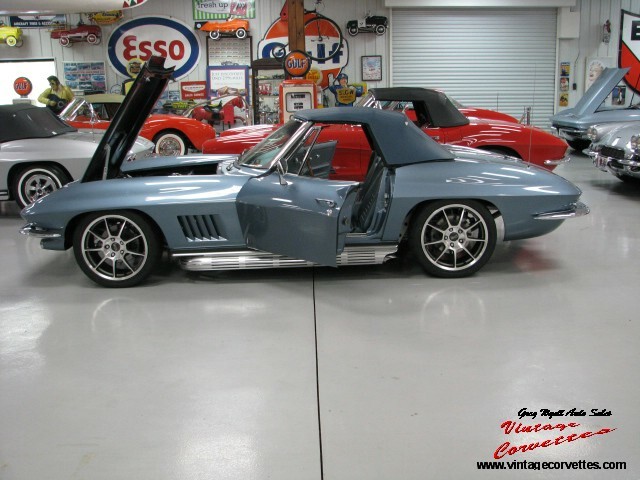 1966 CORVETTE CONVERTIBLE SURVIVOR – NASSAU BLUE – 327 – 350 HP / SOLD!! NASSAU BLUE WITH DARK BLUE INTERIOR, ALL CORRECT ORIGINAL 327 – 350 HP / 4 – SPEED WITH BOTH TOPS. AM/FM RADIO, SAME OWNER FOR OVER 35 YEARS, BOUGHT NEW IN ATLANTA, GA. DRIVE AS IS OR RESTORE TO NCRS CAR. COMPLETE CAR WITH NO MISSING PARTS AND ORIGINAL MOTOR. 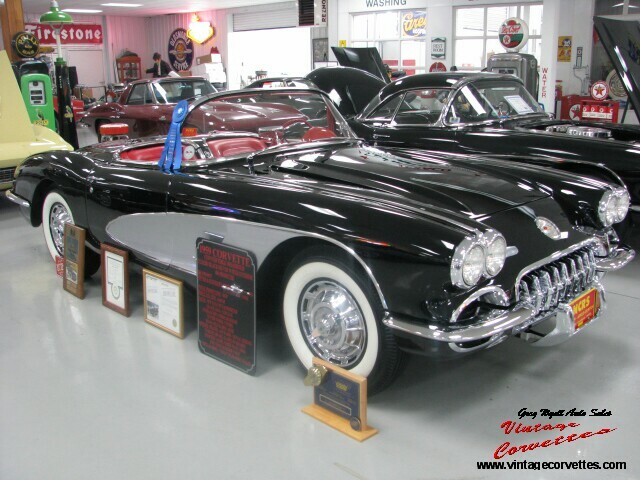 1959 CORVETTE – TUXEDO BLACK – NCRS TOP – FLIGHT, PV AND DUNTOV – SOLD!! 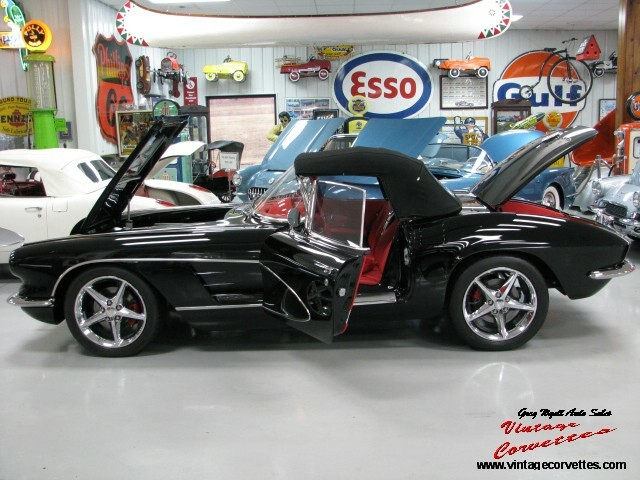 TUXEDO BLACK WITH RED INTERIOR, SILVER COVE AND BLACK SOFT-TOP. ALL ORIGINAL CORRECT NUMBERS 283-230 HP / 3 – SPEED WITH HEATER, SIGNAL SEEKING RADIO PARKING BRAKE ALARM, COURTESY LIGHT AND SUNSHADES. 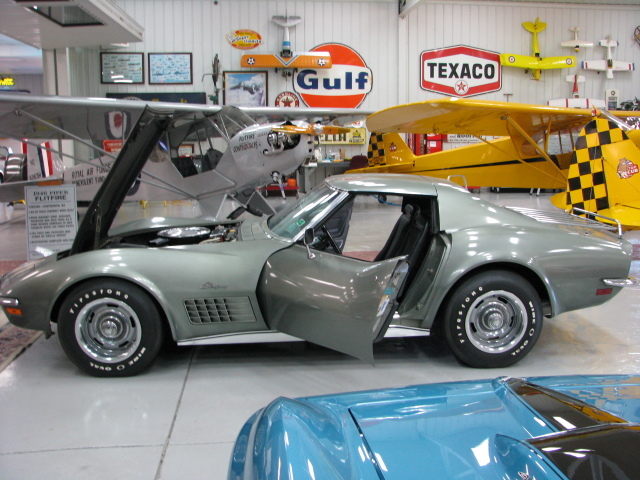 COMPLETE PROFESSIONAL RESTORATION TO SHOW CONDITION, NCRS TOP-FLIGHT, PV AND DUNTOV AWARDS, BLOOMINGTON GOLD, CHEVY VETTE FEST SPINNER CONCOURSE AND TRIPLE-CROWN AWARDS. 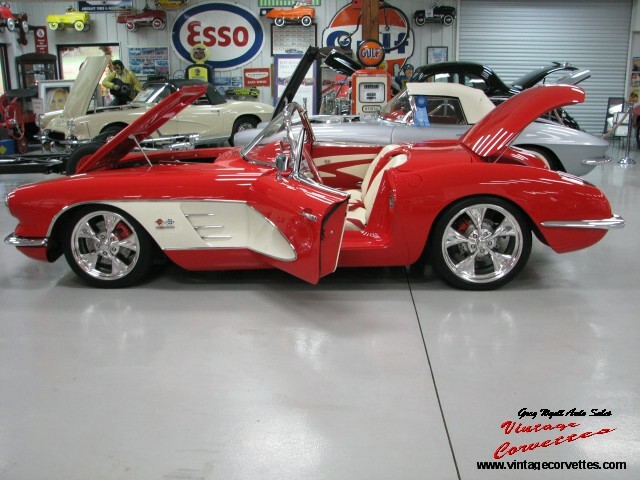 ONE OF THE BEST LOW HP 59 CORVETTES OFFERED FOR SALE TODAY! 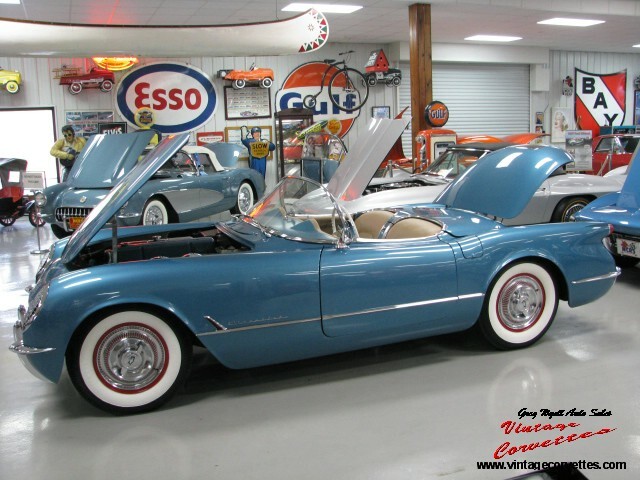 1963 CORVETTE CONVERTIBLE – DAYTONA BLUE – SOLD!! 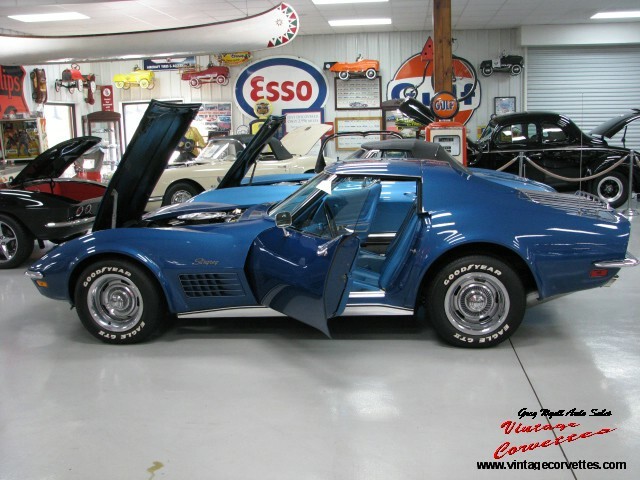 DAYTONA BLUE WITH DARK BLUE INTERIOR. 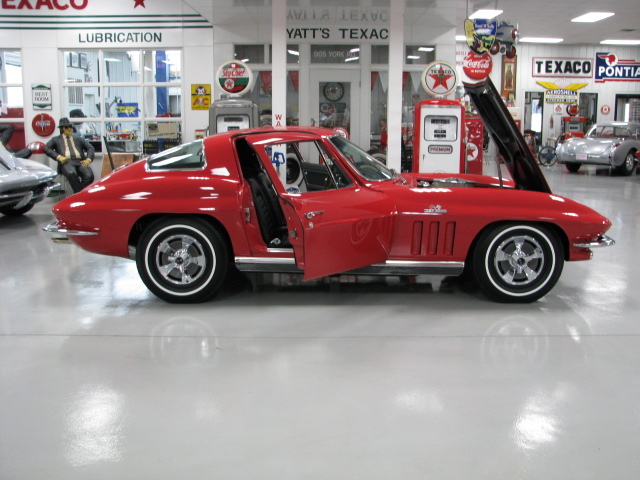 ALL CORRECT NUMBERS 327 – 340 HP / 4 – SPEED WITH BOTH TOPS, BODY OFF RESTORED, NCRS TOP-FLIGHT (97.3). VERY NICE NO HIT BODY, NICE FRAME WITH ALL ORIGINAL COMPONENTS. ALL CORRECT CAR IN GREAT COLORS! 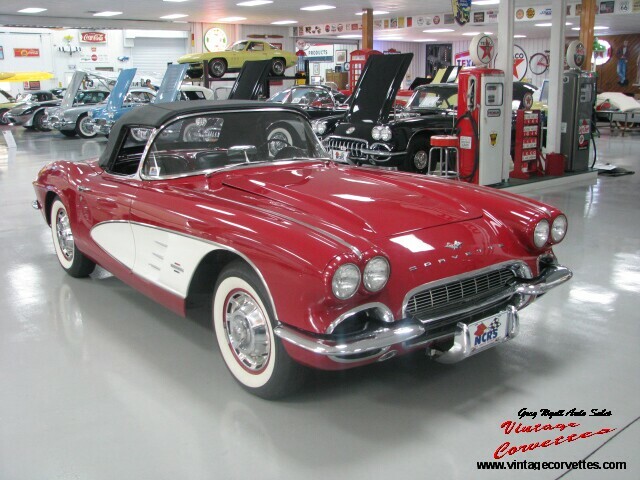 1961 CORVETTE – MAROON – DRIVER 245 HP – SOLD!! MAROON WITH BLACK INTERIOR AND BLACK SOFT-TOP. CORRECT 283 – 245 HP / 4 – SPEED WITH CORRECT COMPONENTS, WHEELS, ETC. OLDER RESTORATION THAT RUNS AND DRIVES GREAT. DRIVER CONDITION CAR! 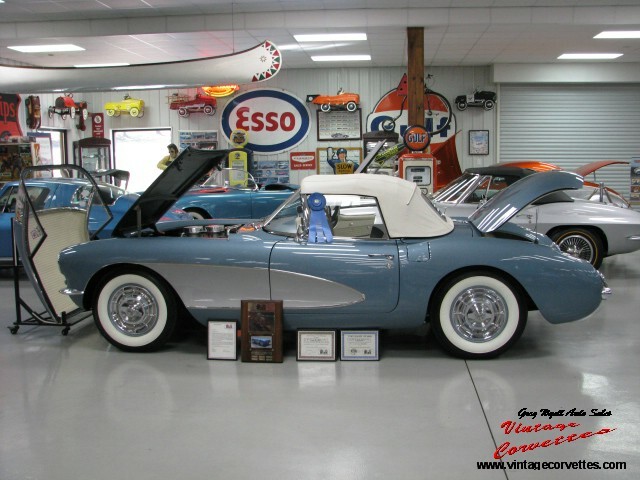 1961 CORVETTE – FAWN BEIGE – BLOOMINGTON GOLD & GOLD SPINNER AWARD – SOLD!! FAWN BEIGE WITH FAWN INTERIOR, WHITE COVE AND WHITE SOFT-TOP. 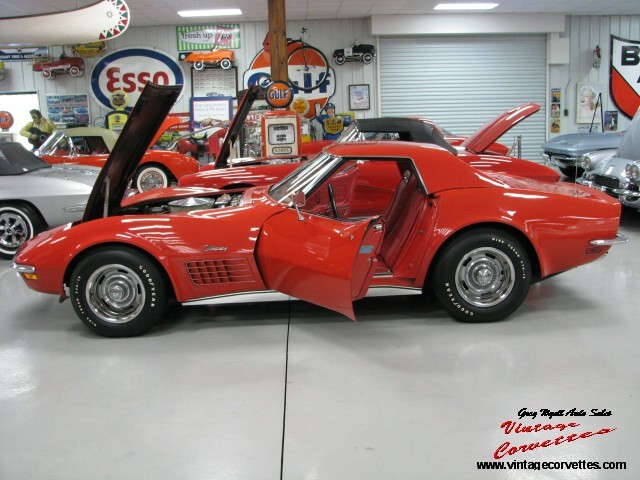 ALL CORRECT NUMBERS 283 – 230 HP / 4 – SPEED WITH A COMPLETE FRAME OFF RESTORATION TO SHOW CONDITION. CAR HAS HEATER, RADIO, SUNSHADES, COURTESY LIGHT AND WINDSHIELD WASHER SYSTEM. 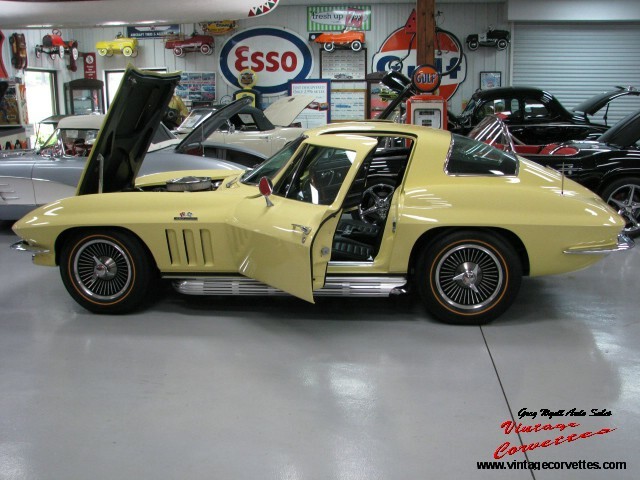 BLOOMINGTON GOLD, CHEVY VETTE FEST AND GOLD SPINNER AWARDS. 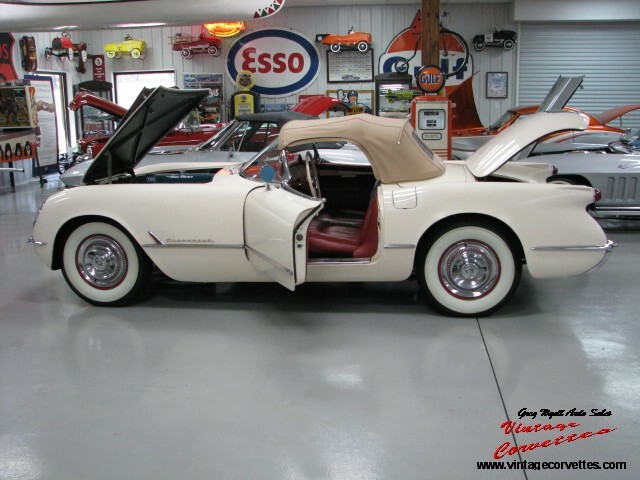 ONE OF THE BEST 61 FAWN BEIGE CARS OFFERED FOR SALE TODAY! 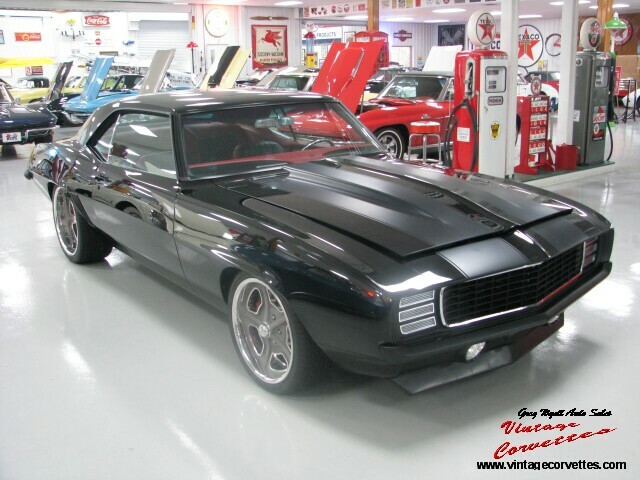 1969 CAMARO RESTO ROD – BLACK – SOLD!! BLACK , BLACK STRIPES AND RED-BLACK INTERIOR. ALL CUSTOM CAR, DETROIT SPEED FRONT CLIP, FORD 9 INCH REAR, 373 GEARS, FRAME TIES, LS-6 MOTOR 405 HP / TRIMEE 5 SPEED TRANSMISSION, WILWOOD BRAKES AND MINI TUBS. BILLET SPECIALTIES FRONT RUNNER, WHEELS AND INSIDE DOOR HANDLES. RS GRILLE AND HEADLIGHTS, VINTAGE AIR – HEAT/ DEFROST, PPG BLUE-BLACK PAINT AND CLASSIC GAUGES. CUSTOM BUILT BY LAKESIDE RODS, ROCKWELL CITY IA. 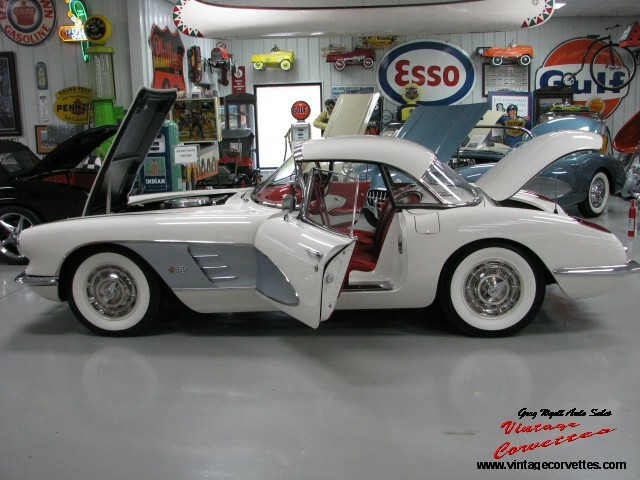 1954 CORVETTE – POLO WHITE – SOLD!! POLO WHITE WITH SPORTSMAN RED INTERIOR. ALL CORRECT NUMBERS ENGINE AND DRIVE TRAIN. OLDER BODY-OFF RESTORED, NICE BODY AND FRAME. 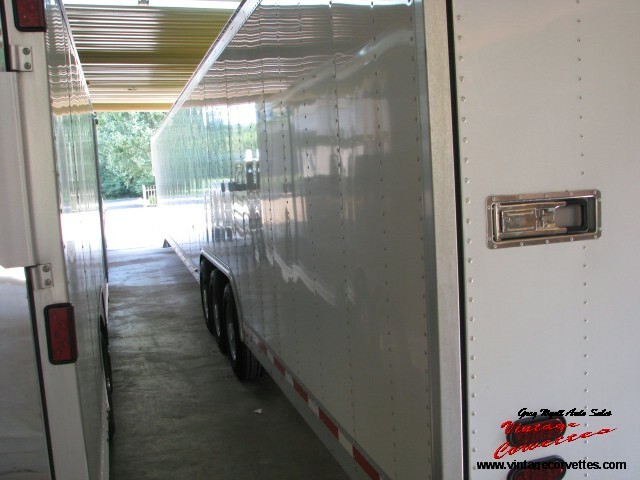 RADIO, HEATER, WASHER SYSTEM, SPARE – JACK AND SIDE WINDOWS. HIGHLY DETAILED AND RUNS AND DRIVES GREAT. 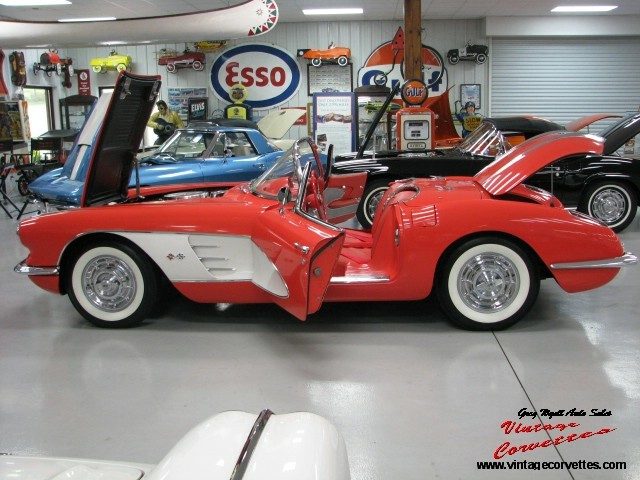 VERY NICE EXAMPLE OF 1954 CORVETTE HISTORY! 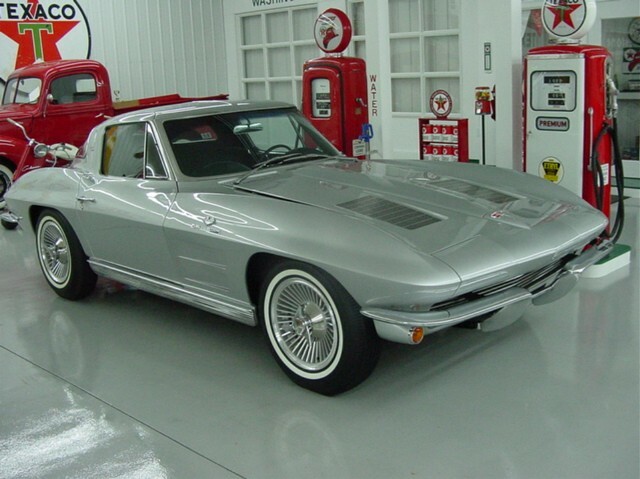 1960 CORVETTE – SILVER RESTO-ROD – FINEST CUSTOM CORVETTE! – SOLD!! 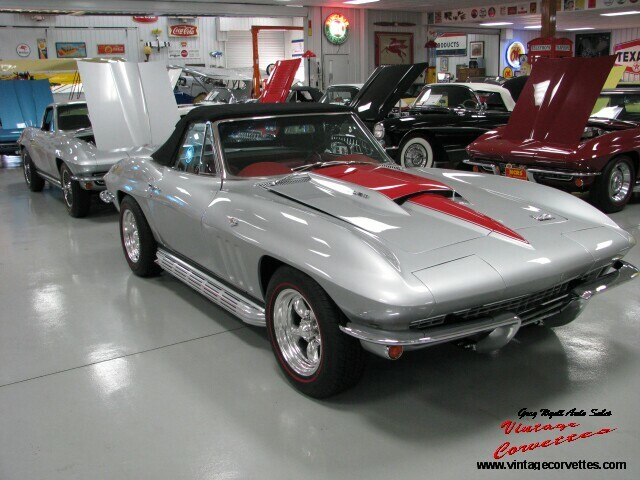 SILVER WITH RED INTERIOR AND WHITE COVE. LT-1 ENGINE, TUNED PORT INJECTION, 700R AUTO TRANS WITH AIR, RAK-STEERING, ADJUSTABLE AIR RIDE SUSPENSION AND BUDNIK WHEELS. 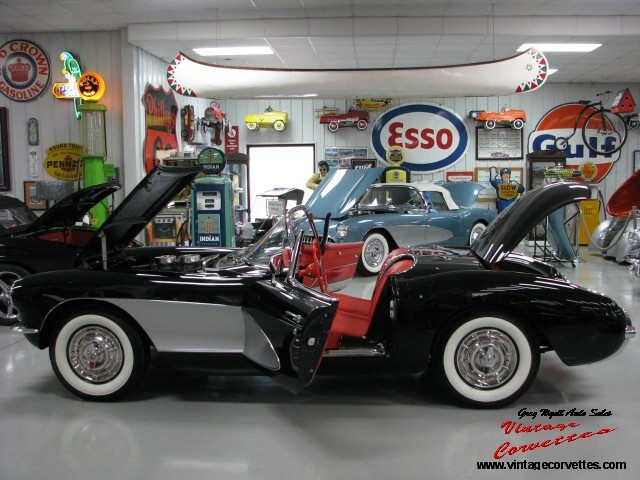 CUSTOM BODY WORK, WINDSHIELD, FRAME, CHASSIS ETC…SHOW WINNER, NO TOP OR SIDE WINDOWS – PURE CONVERTIBLE CAR. ONE OF THE FINEST RESTO RODS OFFERED FOR SALE. ENJOY DRIVING OR WIN ANY SHOW YOU GO TO! THE BEST! 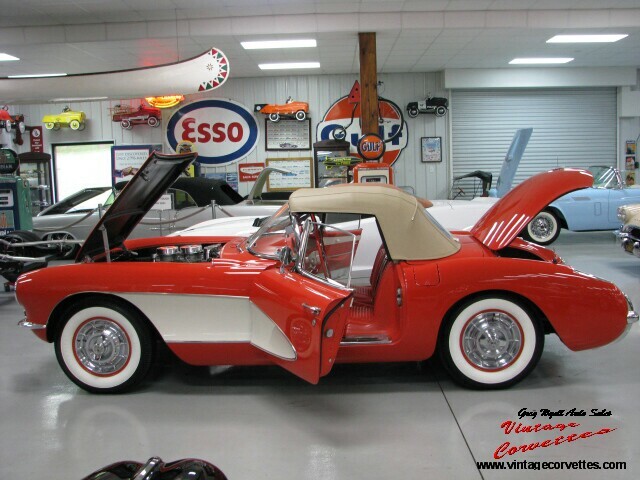 1955 CHEVROLET BEL-AIR CONVERTIBLE – RESTO-ROD – SOLD!! BLACK WITH RED/BEIGE INTERIOR AND BLACK SOFT-TOP. V-8 / 385 STROKER ENGINE / AUTOMATIC WITH POWER STEERING, CUSTOM SUSPENSION, 4 WHEEL POWER DISC BRAKES, TILT COLUMN, AM/FM RADIO, CUSTOM DASH GAGES AND TISSUE DISPENSER. COMPLETE PROFESSIONAL BODY-OFF RESTORED TO SUPER SHOW CONDITION. 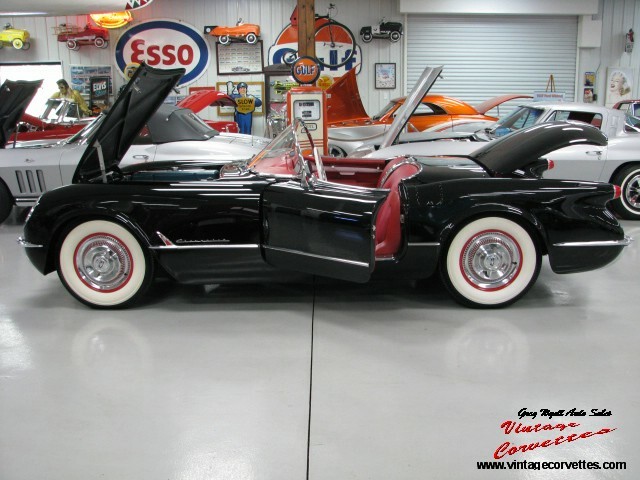 ONE OF THE BEST 55 CONVERTIBLES OFFERED FOR SALE TODAY! 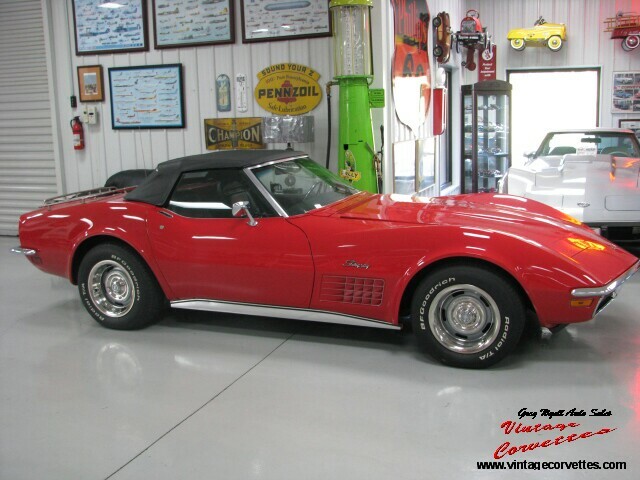 1972 CORVETTE CONVERTIBLE – RED – SOLD!! MILLE MIGLIA RED WITH BLACK LEATHER INTERIOR AND BLACK SOFT-TOP. ALL MATCHING NUMBERS, 350 – 200 HP / AUTOMATIC WITH AIR, POWER STEERING, POWER BRAKES, TILT-TELE STEERING WHEEL, AM/FM RADIO AND POWER WINDOWS. NO HIT BODY, NICE PAINT AND CHROME. RUNS AND DRIVES AS NEW. 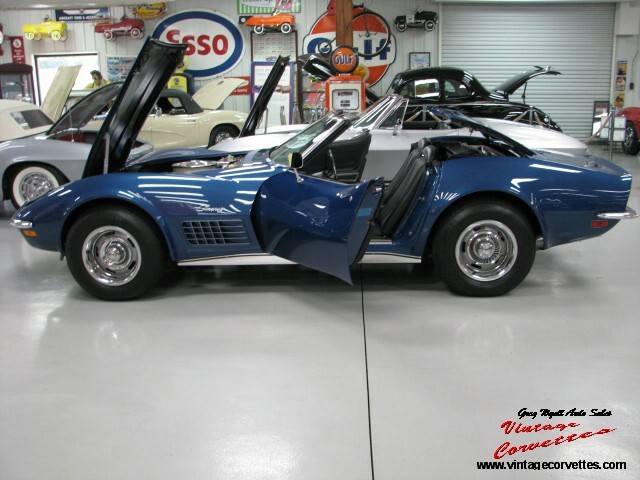 1966 CORVETTE SURVIVOR – BLACK / BLUE WHITE -SOLD!! 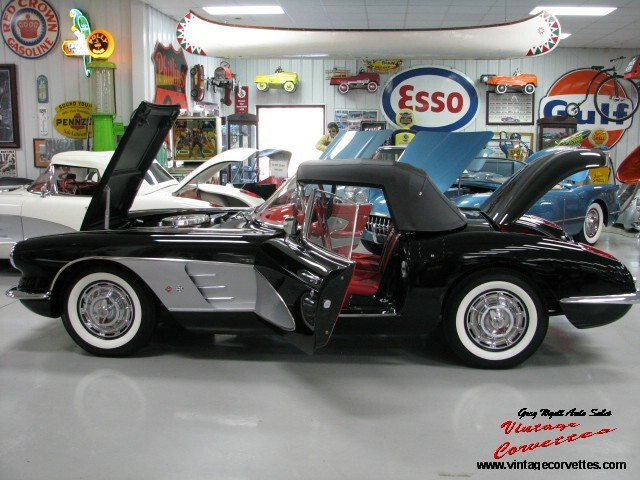 ORIGINAL TUXEDO BLACK WITH BLUE-WHITE INTERIOR AND WHITE SOFT-TOP. 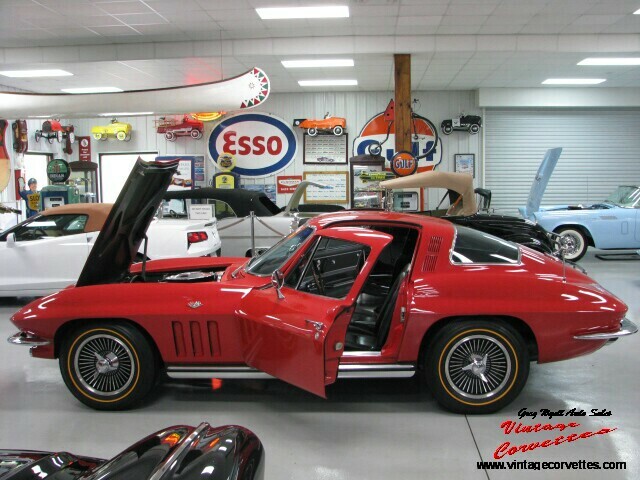 ALL CORRECT 327-300 HP / AUTOMATIC WITH POWER STEERING, POSI REAR, TINTED GLASS AND AM-FM RADIO. 775 X15 WHITEWALL TIRES, BOTH TOPS AND DAY-NIGHT MIRROR. ORIGINAL SALES INVOICE, PROTECTO – PLATE, OWNERS MANUAL WITH SALESMANS CARD, RADIO CARD, OWNER CARD AND LAPEL PIN FROM GM. 59,168 ORIGINAL MILES WITH SOME OWNER HISTORY. 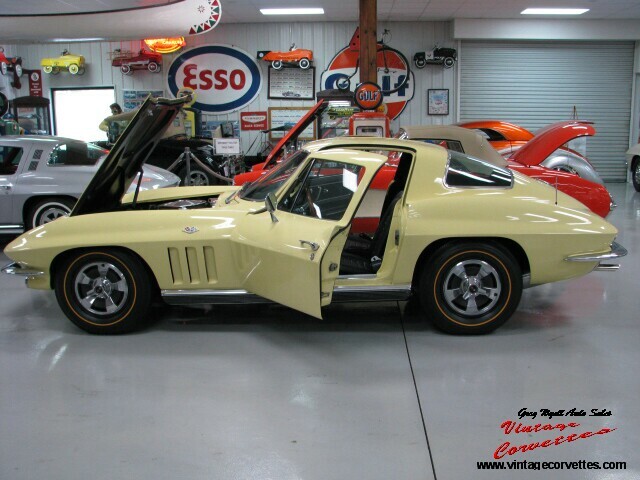 RARE PAINT COLOR COMBINATION ON A VERY NICE SURVIVOR. 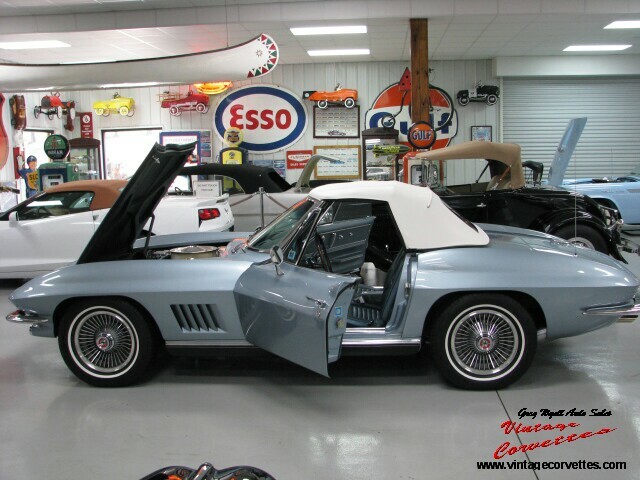 1966 CORVETTE IN UNBELIVABLE CONDITION. DRIVES AS NEW! 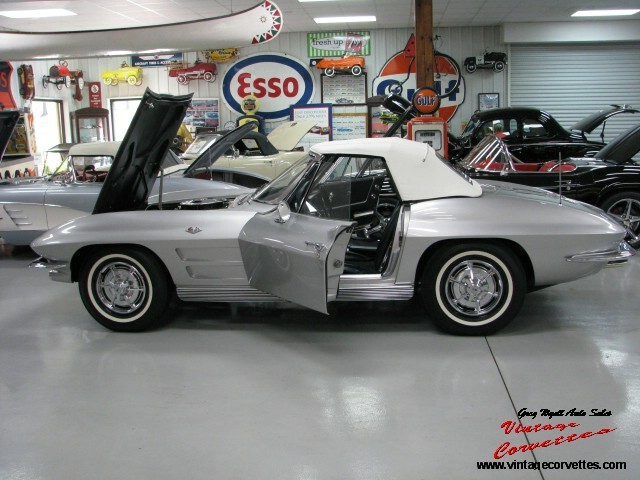 1966 CORVETTE CONVERTIBLE – SILVER – SOLD!! SILVER WITH BLACK INTERIOR AND BLACK SOFT-TOP ONLY. ALL MATCHING NUMBERS 327-300 HP / AUTOMATIC. RARE RADIO DELETE CAR, DAY/NIGHT MIRROR, ORIGINAL SALES INVOICE, PROTECTO PLATE, OWNERS MANUAL, THANK YOU LETTER FROM GM AND OWNER CARD. NO HIT BODY AND SOLID FRAME. BODY ON RESTORED CAR THAT LOOKS AND RUNS GREAT! BEST LOW HP CONVERTIBLE OFFERED FOR SALE TODAY! 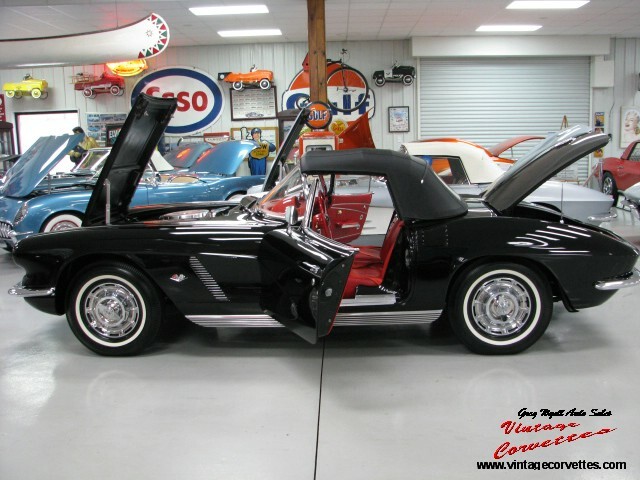 1962 CORVETTE – TUXEDO BLACK – SOLD!! 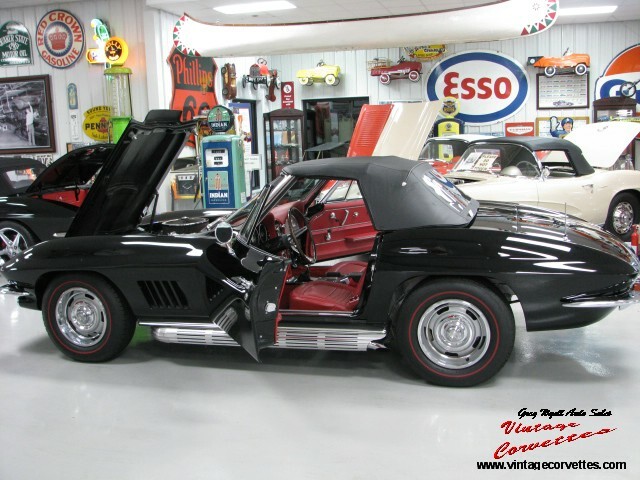 TUXEDO BLACK WITH RED INTERIOR. 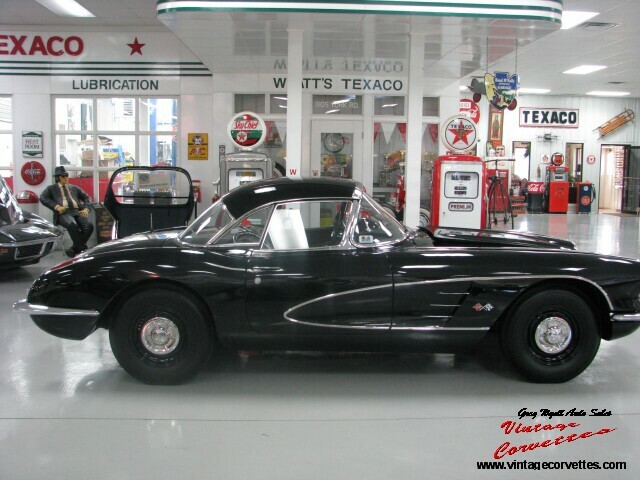 BLACK SOFT-TOP / ALL CORRECT NUMBERS 327 – 340 HP / 4 – SPEED WITH HEATER, RADIO, COURTESY LIGHT AND BOTH TOPS. 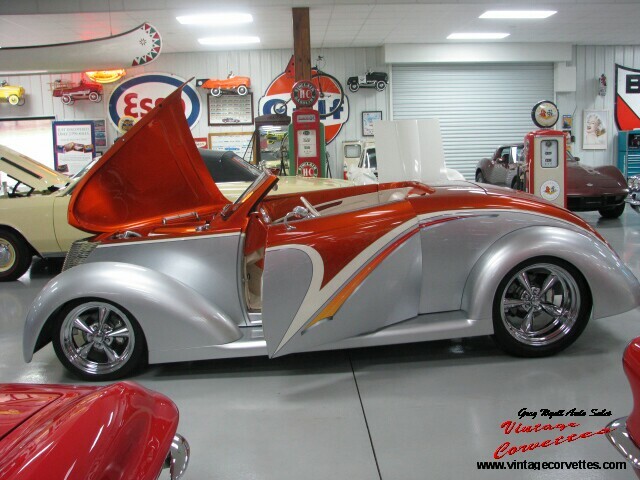 VERY NICE PAINT, CHROME AND INTERIOR. STRAIGHT BODY AND FRAME. SUPER NICE DRIVER CONDITION CAR THAT RUNS AND DRIVES GREAT! 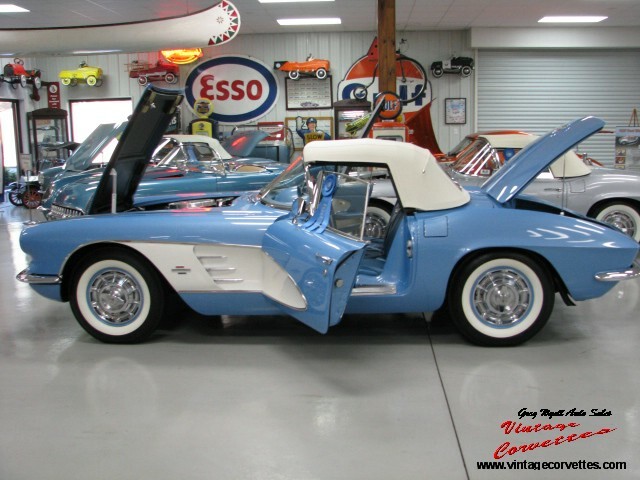 1966 CORVETTE CONVERTIBLE – NASSAU BLUE – NCRS TOP-FLIGHT, PV AND DUNTOV! – SOLD!! NASSAU BLUE WITH BRIGHT BLUE INTERIOR AND WHITE SOFT-TOP. ALL CORRECT ORIGINAL 327 – 350 HP / 4 – SPEED WITH POSI REAR, DUAL SIDE EXHAUST, TINTED GLASS, POWER STEERING, POWER BRAKES, TEAK STEERING WHEEL, TELESCOPIC COLUMN AND AM/FM RADIO.NO HIT BODY, PERFECT FRAME, FRAME OFF RESTORED TO SHOW CONDITION! OWNER HISTORY BACK TO ORIGINAL OWNER, BOUGHT NEW FROM FRIENDLY CHEVROLET / DALLAS TX (ZONE 07354). 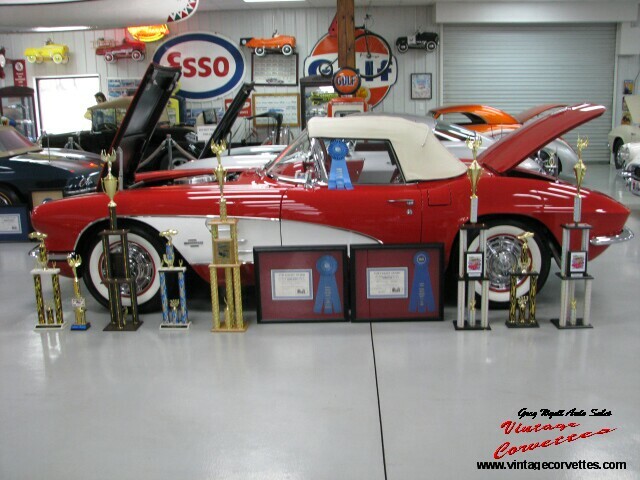 3 TIME NCRS TOP FLIGHT (99.1), PV AND DUNTOV AWARDS. 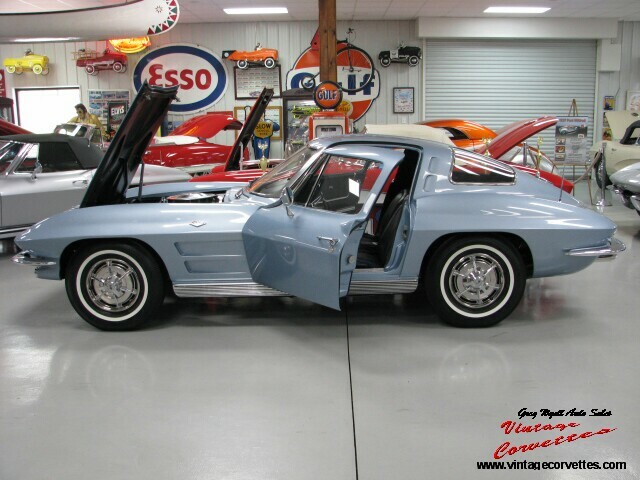 ONE OF THE BEST 350 HP 66 DUNTOV CORVETTES OFFERED FOR SALE TODAY. 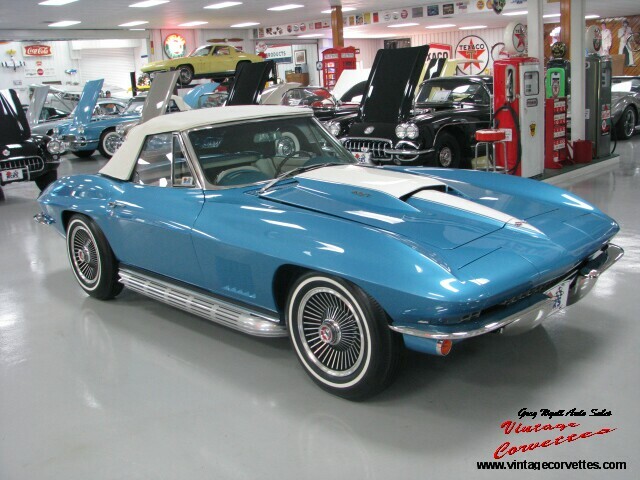 OWN THE BEST 66! 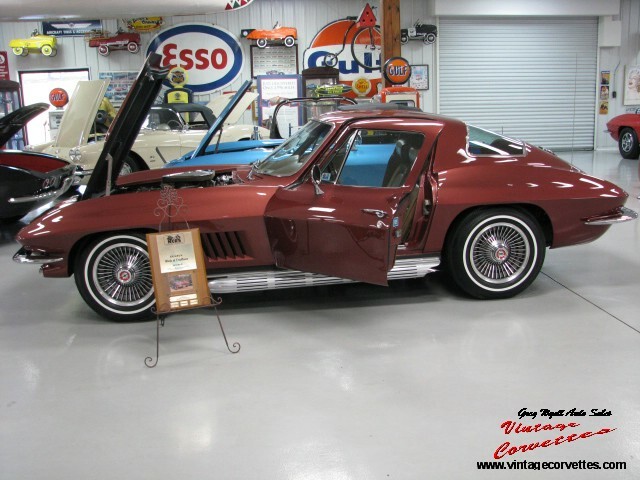 1970 CORVETTE COUPE – ONE OWNER SURVIVOR – CORVETTE BRONZE – SOLD!!! 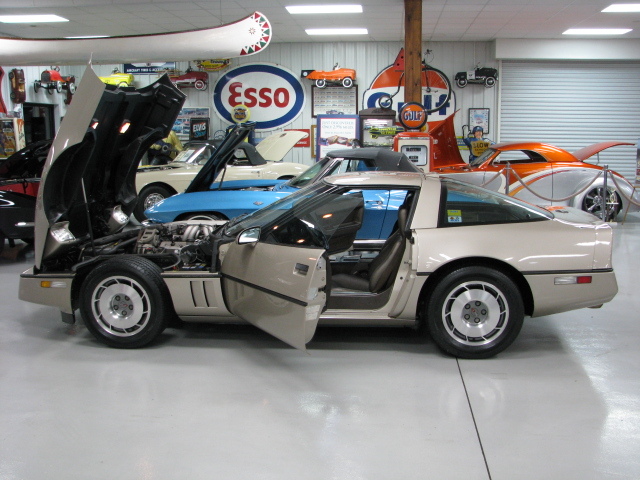 ONE OWNER SURVIVOR CORVETTE BRONZE WITH SADDLE LEATHER INTERIOR. 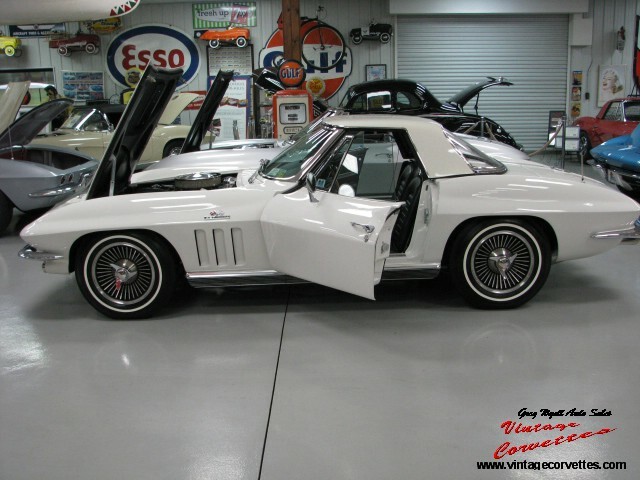 ALL CORRECT ORIGINAL 350 – 300 HP / 4 – SPEED WITH POWER WINDOWS, P-02 WHEEL COVERS AND WHITE WALL TIRES. TILT-TELE STEERING WHEEL, ORIGINAL SALES INVOICE, OWNERS MANUAL, GLOVE BOX PAPERWORK AND PROTECTO PLATE. 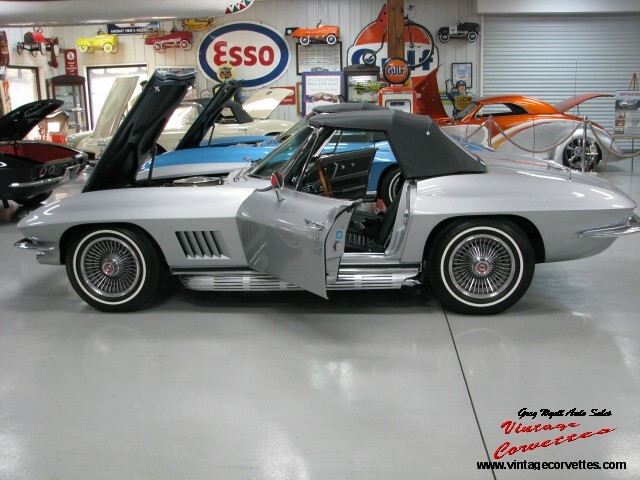 NEAR PERFECT PAINT, CHROME, ETC…ONE OF THE BEST OFFERED FOR SALE! SILVER PEARL WITH BLACK INTERIOR AND BLACK SOFT-TOP. ALL CORRECT MATCHING NUMBERS 327 – 300 HP / 4-SPEED WITH POWER STEERING, POWER BRAKES, RARE RADIO DELETE, HAZARD WARNING SWITCH, TINTED GLASS, TEAK STEERING WHEEL, TELESCOPIC STEERING WHEEL AND FACTORY AIR. 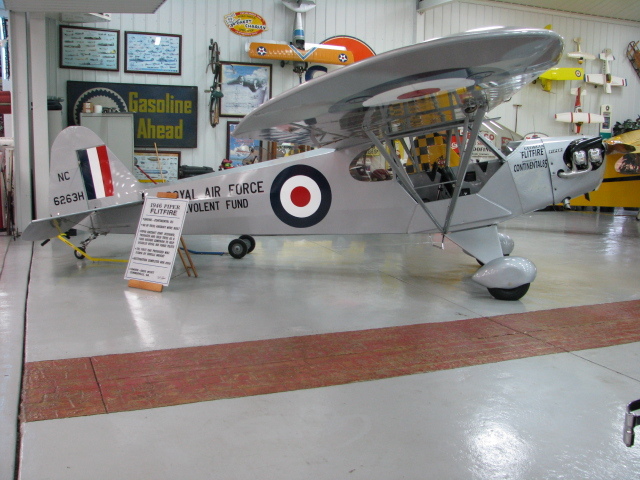 COMPLETE FRAME OFF RESTORED TO NCRS CONDITION, 2 TIME NCRS TOP-FLIGHT AND FOUNDERS AWARD. ALL GLOVE BOX PAPERWORK INCLUDING PROTECTO PLATE, OWNERS MANUAL AND ACCESSORIES BOOK (PART#3882774). 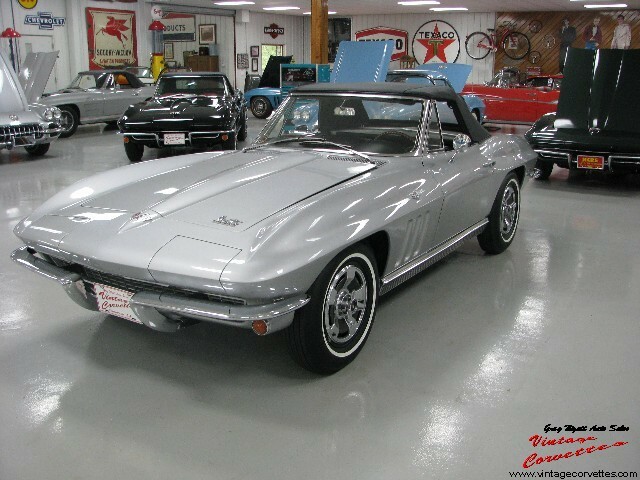 ONE OF THE BEST 1966 SILVER CONVERTIBLES OFFERED FOR SALE TODAY! 1967 CHEVELLE – 2 / DOOR POST RESTO MOD – BLACK ON BLACK – SOLD!! 2 DOOR POST, BLACK CHERRY PAINT WITH BLACK INTERIOR. HIGH PERFORMANCE 350 TRIMIC / 5 SPEED WITH VINTAGE AIR, COATED HEADERS, 3 INCH EXHAUST, POWER STEERING, 4 WHEEL POWER DISC BRAKES AND BILLET SPECIALTIES WHEELS. SHOW QUALITY PAINT AND INTERIOR. FRAME OFF RESTORED RESTO MOD, STRAIGHT RUST FREE BODY. SHOW THIS CAR OR DRIVE FOR FAST FUN! 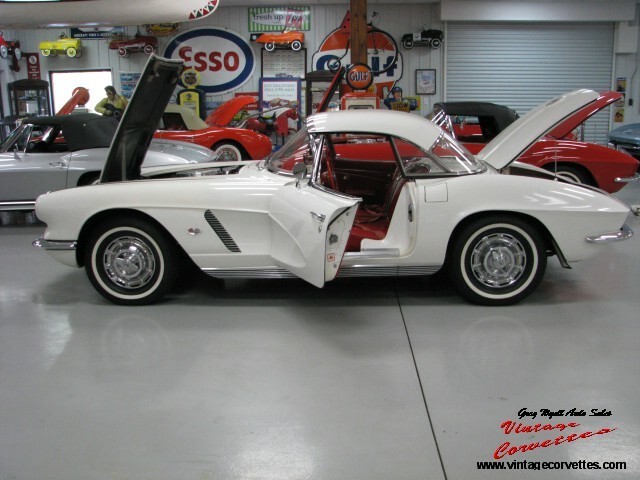 1959 CORVETTE – ERMINE WHITE / 283 – 270 HP – SOLD!! 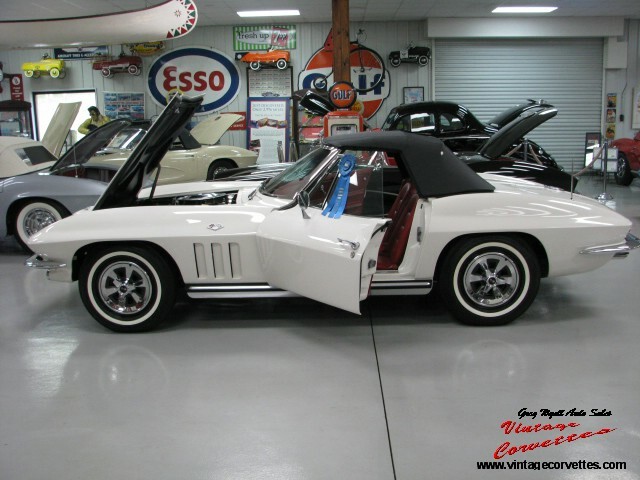 ERMINE WHITE WITH RED INTERIOR , SILVER COVE AND BLACK SOFT-TOP. 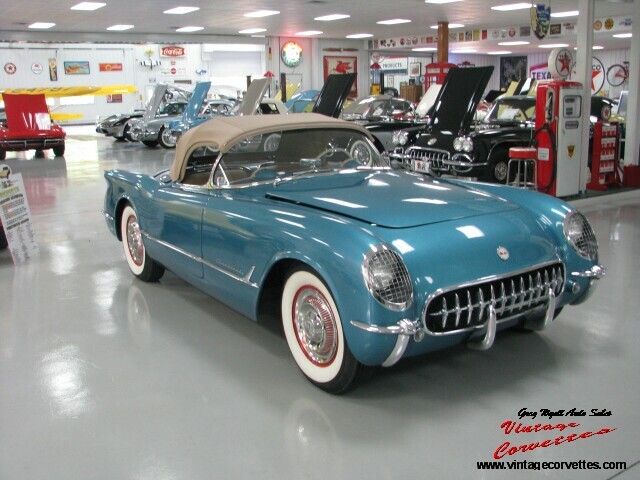 ALL MATCHING NUMBERS 283 – 270 HP / 4 – SPEED WITH RADIO, HEATER, WHITEWALL TIRES, VERY NICE BODY AND FRAME. COMPLETE PROFESSIONAL FRAME OFF RESTORATION TO SUPER SHOW CONDITION. ALL NEW, READY FOR NCRS JUDGING, ONE OF THE BEST WE WILL SEE OFFERED FOR SALE TODAY. 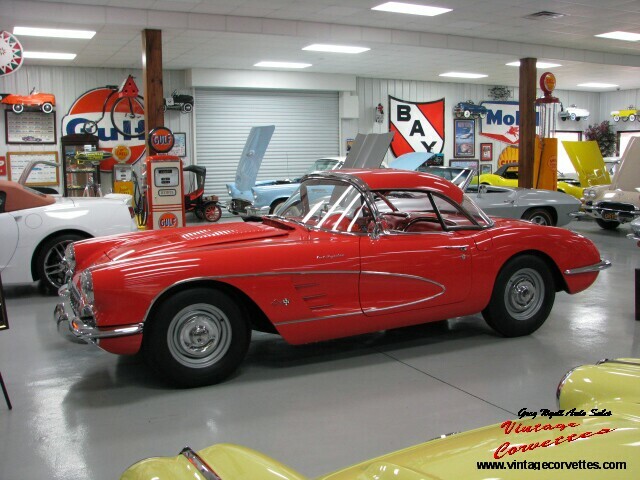 1959 CORVETTE HISTORY AT IT’S BEST! SAME OWNER FOR 26 YEARS! SILVER PEARL WITH SILVER INTERIOR. 327 – 365 HP / 4 – SPEED. POSI – REAR, TINTED GLASS, AM-FM RADIO, TEAK WHEEL AND QUICK TAKE OFF WHEELS. NCRS TOP – FLIGHT! ONE OF THE FINEST 365 HP COUPE’S AVAILABLE TODAY. OUTSTANDING RESTORATION! 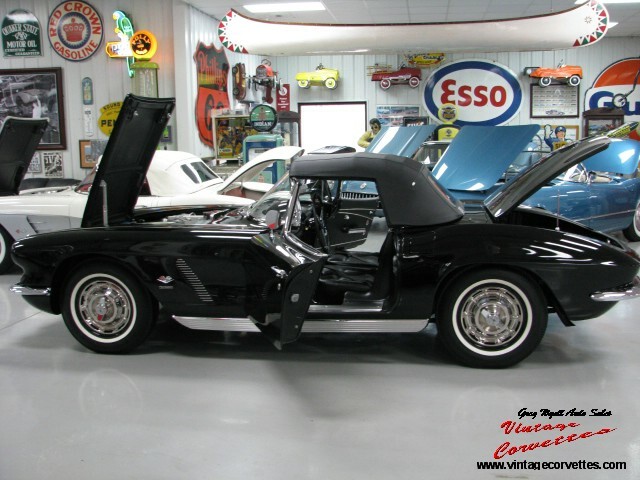 1966 CORVETTE CONVERTIBLE BLACK 427 – 390 HP- SOLD!! TUXEDO BLACK (PRODUCTION 1190) WITH SADDLE LEATHER INTERIOR AND SADDLE TOP. 427 – 390 HP TRANSISTOR IGNITION SYSTEM, 4 – SPEED. POWER WINDOWS, TEAKWOOD WHEEL, FACTORY SIDE MOUNT EXHAUST, POSITRACT AXLE 336. FACTORY KELSEY – HAYES QUICK TAKE-OFF WHEELS. 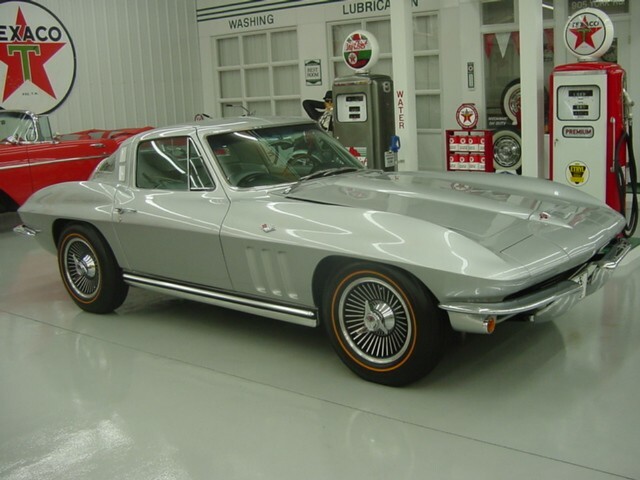 PROTECTO PLATE, ORIGINAL WINDOW STICKER, CORVETTE ORDER FORM, OWNERS MANUAL, CORVETTE OWNERS CARD, WARRANTY BOOK, ORIGINAL SALES INVOICE FROM DEALER. OWNER HISTORY BACK TO NEW. DETAILED TO SHOW CONDITION. RUNS AND DRIVES PERFECT. 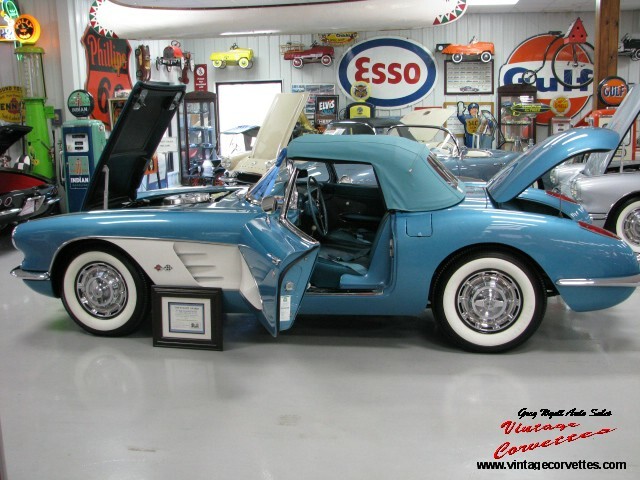 1958 CORVETTE SILVER BLUE – SOLD!! SILVER BLUE WITH SILVER BLUE INTERIOR . WHITE SOFT – TOP AND COVES. 283 – 230 HP / AUTOMATIC WITH POWER WINDOWS. 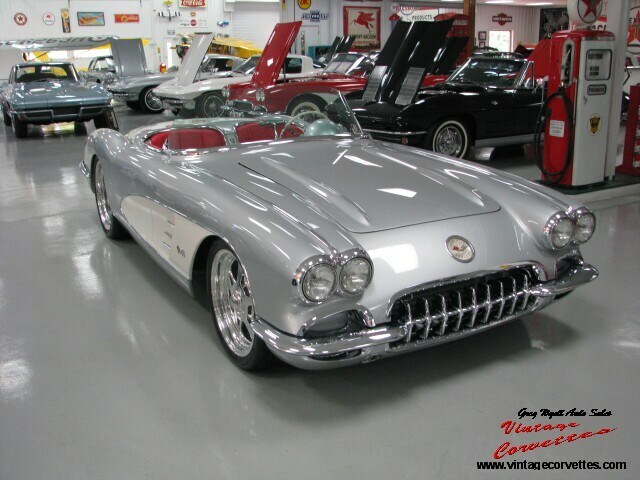 2 OWNER CAR WITH 90% ORIGINAL PAINT, CHROME AND INTERIOR. RUNS AND DRIVES GREAT. FRESH ENGINE, TRANSMISSION, TIRES, EXHAUST AND BRAKES. ALL MATCHING NUMBERS AND CODES. 58 ORIGINAL HISTORY! THIS CAR IS EXCELLENT DRIVER QUALITY. 1 OF 402 BUILT AZTEC COPPER WITH BEIGE INTERIOR AND COVE. RADIO, HEATER, BOTH TOPS, 265 WITH DUAL CARBS 225 HP 3-SPEED WITH ALL MATCHING NUMBERS. COMPLETE BODY-OFF RESTORATION TO SHOW CONDITION. 11,617 ORIGINAL MILES. MULTIPLE NCRS TOP-FLIGHT AWARDS. RESTORATION PHOTOS AND OWNER HISTORY BACK TO NEW. 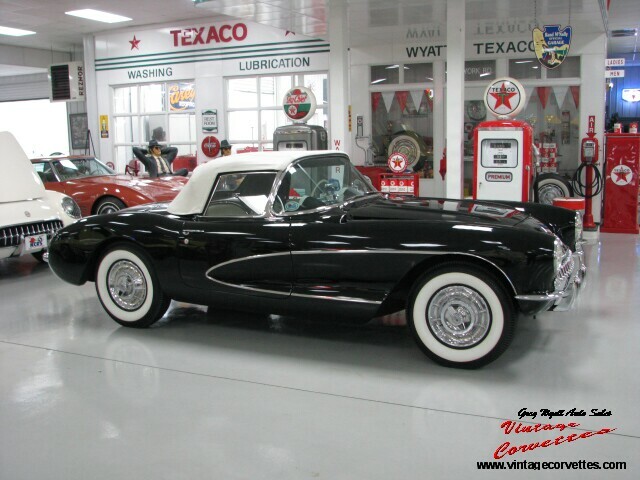 THIS IS A FINE EXAMPLE OF A MUSEUM QUALITY 56 CORVETTE. 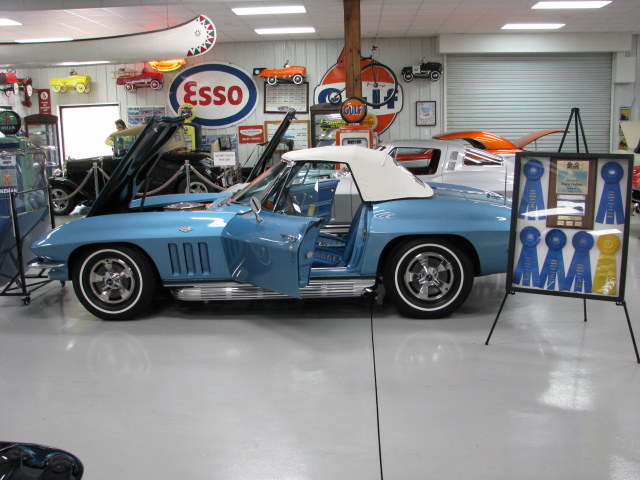 1967 CORVETTE CONVERTIBLE ELKHART BLUE – SOLD!! ELKHART BLUE WITH TEAL INTERIOR AND WHITE SOFT – TOP. 327 – 350 HP / 4 – SPEED WITH ALL MATCHING NUMBERS. CLOSE RATIO, TINTED GLASS, OFF ROAD EXHAUST AND POSI – REAR. PROFESSIONAL BODY – OFF RESTORATION TO SHOW CONDITION. NO HIT BODY AND PERFECT FRAME. LACQUER PAINT. NCRS OR BLOOMINGTON READY. 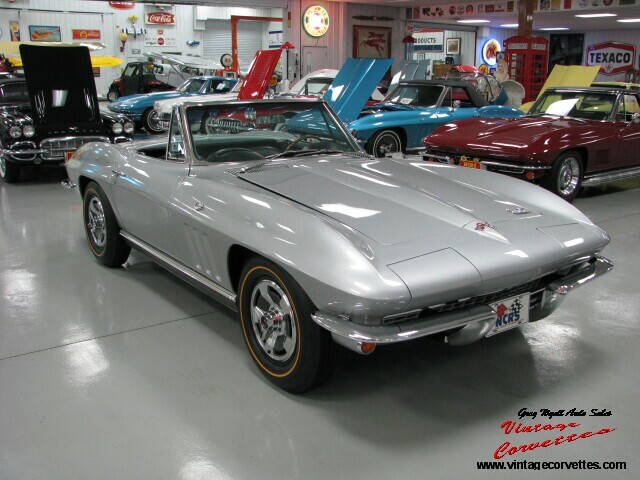 ONE OF THE BEST 67 CONVERTIBLE’S AVAILABLE TODAY! HISTORY AT IT BEST. 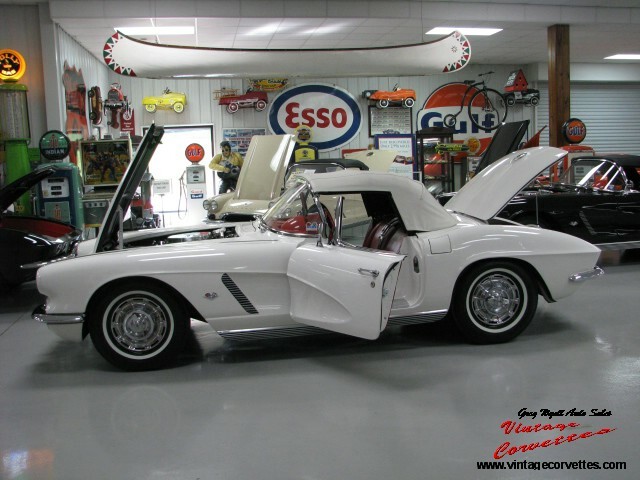 1965 CORVETTE WHITE COUPE – SOLD!! ERMINE WHITE WITH BLACK LEATHER INTERIOR. 327 – 250 HP AUTOMATIC. 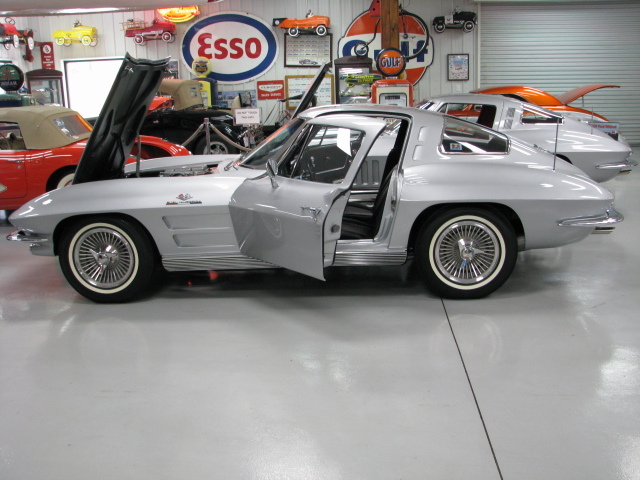 POWER STEERING, TINTED GLASS, KNOCK – OFFS WITH GOLD LINE TIRES. 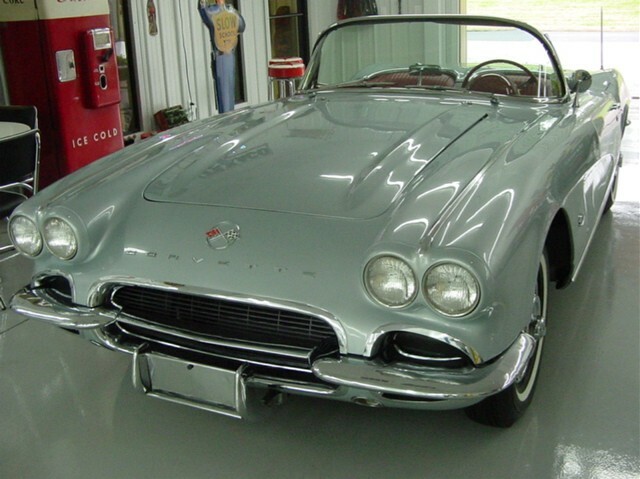 COMPLETE BODY – OFF RESTORATION TO SHOW CONDITION. 2 OWNER CAR WITH PROTECTO PLATE. ORIGINAL OWNERS MANUAL, MILEAGE DOCUMENTS AND RECEIPTS. NO HIT BODY. ALL MATCHING NUMBERS! 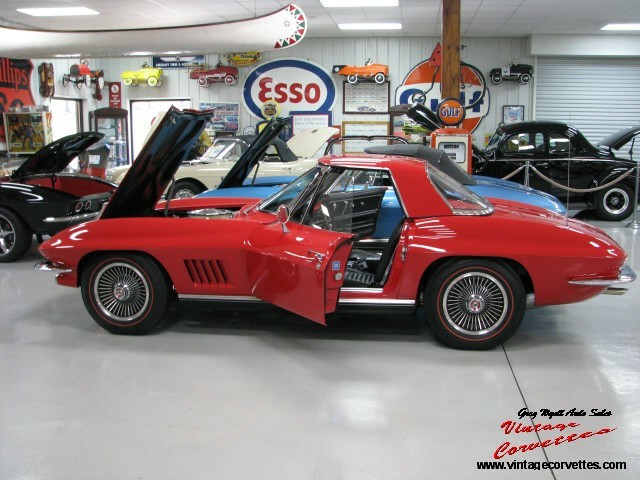 1966 CORVETTE RALLY RED COUPE 350 HP- SOLD!! RALLY RED WITH BLACK LEATHER INTERIOR. 327 – 350 HP / 4 – SPEED. FACTORY AIR, POWER STEERING, POWER BRAKES, POWER ANTENNA AND TINTED GLASS. POSI REAR, SIDE MOUNT EXHAUST, KNOCK – OFF WHEELS WITH GOLD LINE TIRES. PROFESSIONAL BODY – OFF RESTORED TO MUSEUM QUALITY. NO HIT BODY. 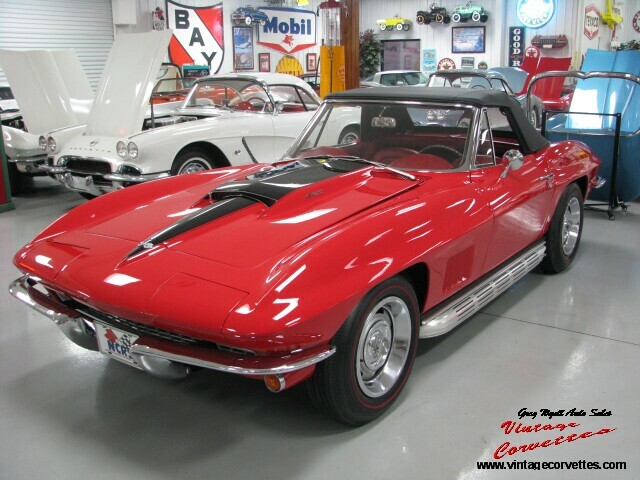 ONE OF THE BEST 66 FACTORY AIR COUPES AVAILABLE! 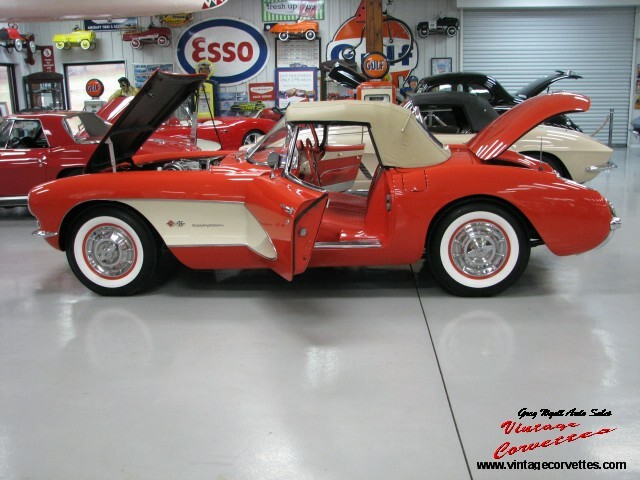 1960 CORVETTE ROMAN RED – SOLD!! ROMAN RED WITH RED INTERIOR / WHITE COVE AND SOFT TOP. 283 – 230 HP / 4 – SPEED. SUN SHADES, WONDER-BAR RADIO, COURTESY LIGHT, SEAT BELTS AND HEATER. PROFESSIONAL RESTORATION TO SHOW CONDITION. COPY OF ORIGINAL TITLE AND OWNER HISTORY. 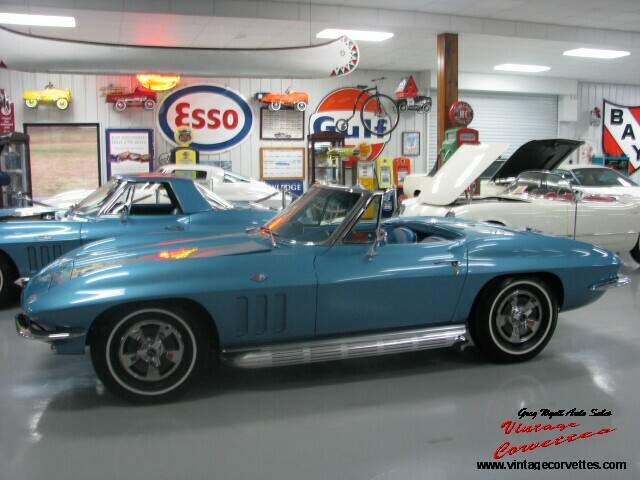 RESTORATION PHOTO’S , AWARDS AND TROPHIES WITH CAR. 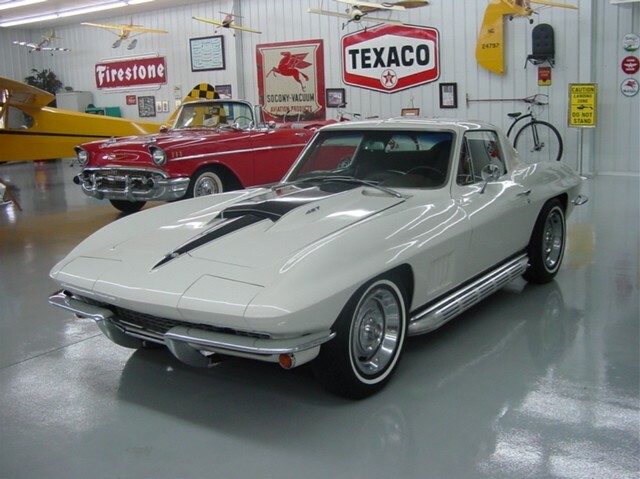 1964 CORVETTE ONE OWNER ORIGINAL PAINT- SOLD!! SILVER BLUE WITH DARK BLUE INTERIOR. WHITE SOFT – TOP. 327 – 250 HP / 4 – SPEED. AM-FM RADIO, TINTED GLASS, BOTH TOPS, BACK-UP LAMPS. ONE OWNER WITH ORIGINAL PAINT AND INTERIOR. EXCELLENT BLOOMINGTON SURVIVOR CANDIDATE. 54K ORIGINAL MILES. CAR IS UNBELIEVABLY IN ORIGINAL CONDITION. ALL CORRECT NUMBERS AND DATES. 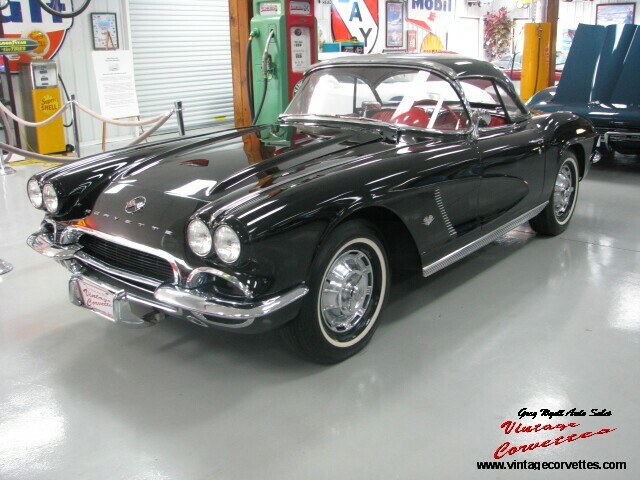 MUSEUM QUALITY CAR! 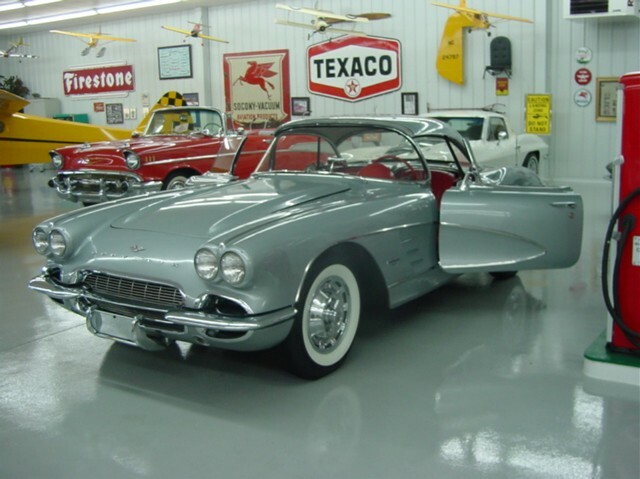 1961 CORVETTE SATEEN SILVER – SOLD!! 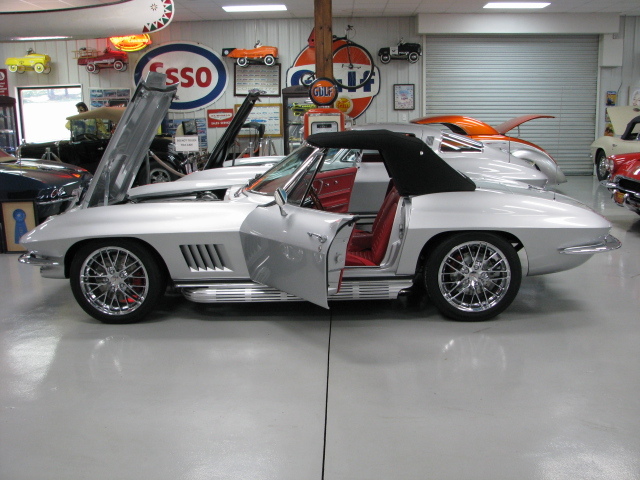 SATEEN SILVER WITH RED INTERIOR AND WHITE SOFT-TOP (BOTH TOPS). 283 – 315 HP FUELIE / 4 – SPEED. SUNSHADES, COURTESY LIGHT AND WASHER SYSTEM. BODY – OFF RESTORATION TO SHOW CONDITION. NO HIT BODY AND PERFECT FRAME. ONE OF THE FIRST 61 FUELIES AVAILABLE. LACQUER PAINT. CORRECT NUMBERS AND CODES. INVESTMENT QUALITY CAR! 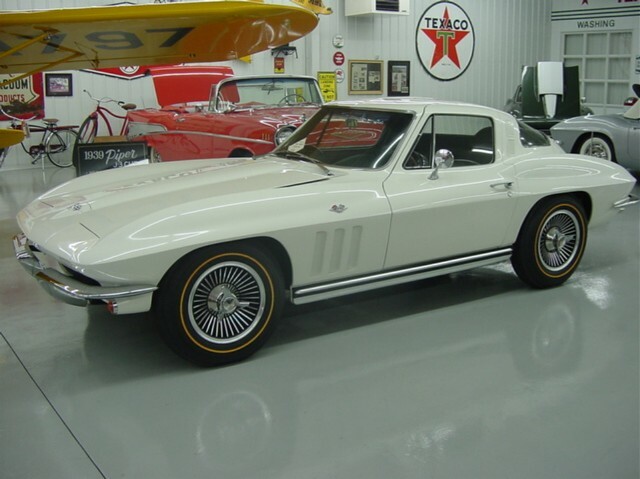 1967 CORVETTE COUPE WHITE – SOLD!! ERMINE WHITE WITH SADDLE INTERIOR. 427 – 400 HP / 4 – SPEED. TINTED GLASS, POSI-REAR, TI-IGNITION, SIDE PIPES, ORIGINAL RALLY WHEELS. ONE REPAINT ONLY. BELIEVED TO BE 38K ORIGINAL MILES. FRAME STENCIL AND MARKINGS VISIBLE ON FRAME FROM FACTORY. PAPER TAGS ON FRONT SPRINGS FROM FACTORY. ALL CORRECT NUMBERS AND DATES. NO HIT BODY. NICE ORIGINAL CAR THAT HAS NOT BEEN APART. TANK STICKER WITH CAR. RUNS AND DRIVES PERFECT. 67 HISTORY AT IT’S BEST! SATEEN SILVER WITH RED INTERIOR AND WHITE COVE. WHITE SOFT – TOP ONLY. 283 – 315 HP FUELIE / 4 – SPEED. COURTESY LIGHT, BRAKE WARNING LIGHT, SUN SHADES, WINDSHIELD WASHER SYSTEM AND WONDER BAR RADIO. NCRS TOP – FLIGHT (99.4) WITH JUDGING SHEETS AND CERTIFICATES. RESTORATION PHOTOS. BODY – OFF TO SHOW CONDITION. ALL CORRECT NUMBERS AND DATE CODES. NO HIT BODY. ONE OF THE FINEST 61 FUELIES AVAILABLE. INVESTMENT QUALITY CAR! 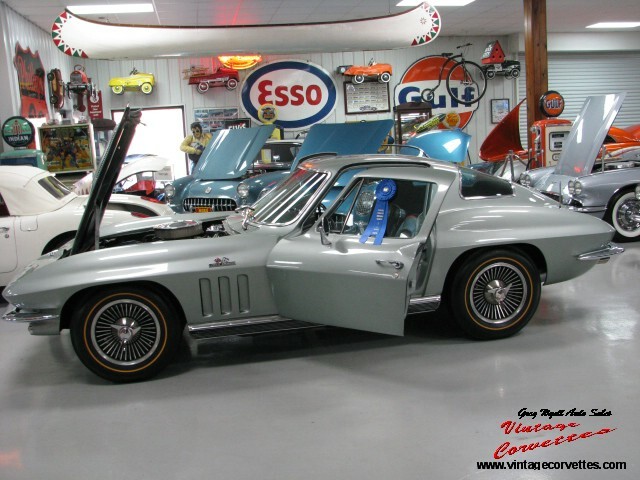 1967 CORVETTE 427/ 435- SOLD!! GOODWOOD GREEN WITH ORIGINAL SADDLE TAN LEATHER INTERIOR. 427 – 435 HP, M21 4 – SPEED WITH 355 POSI. TINTED GLASS, POWER BRAKES, AM-FM RADIO, SHOULDER HARNESS, TELE-COLUMN AND T.I. THREE (3) TIME NCRS TOP-FLIGHT (LAST JUDGING 2002), JUDGING SHEETS, WINDOW STICKER, TANK STICKER, RECEIPTS AND PHOTO’S. SATEEN SILVER WITH RED INTERIOR. 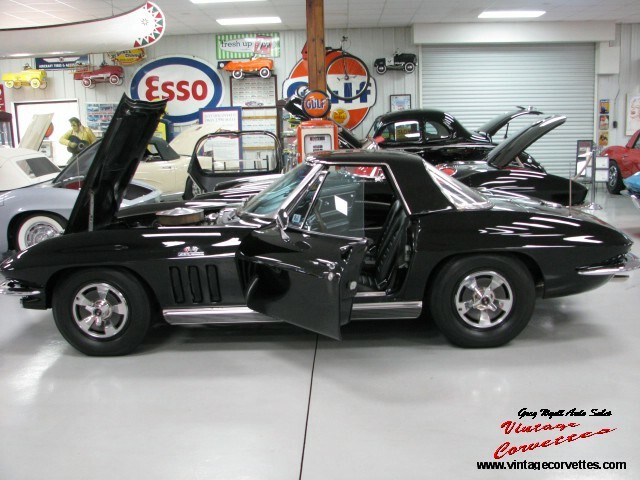 MATCHING NUMBERS 327 – 250 HP / 4 – SPEED WITH BOTH TOPS – BLACK SOFT TOP. SEAT BELTS, WONDER – BAR RADIO, SUNSHADES AND BRAKE WARNING LIGHT. BODY – OFF RESTORED TO SHOW CONDITION. 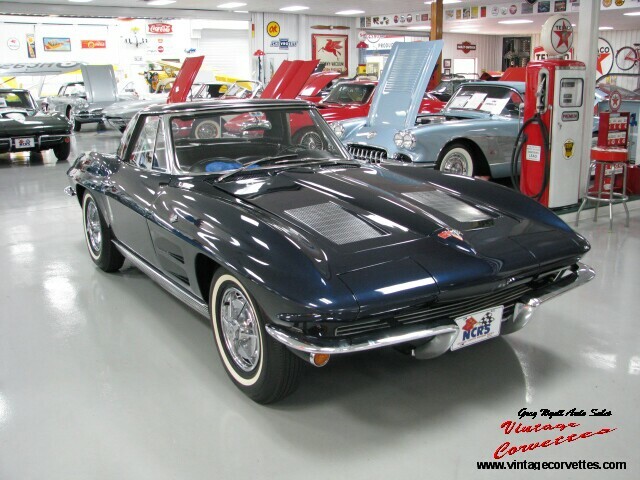 NICE 62 HISTORY! 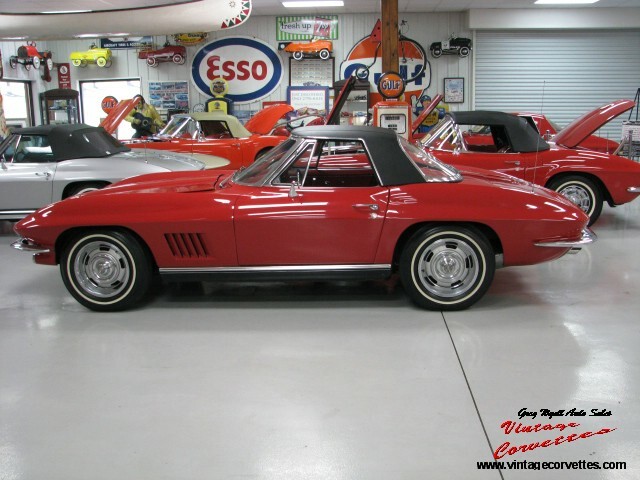 1966 CORVETTE COUPE – SOLD!! SUNFIRE YELLOW WITH BLACK LEATHER INTERIOR. 327 – 350 HP / 4 – SPEED. FACTORY AIR, POWER STEERING, POWER WINDOWS, TINTED GLASS AND POWER ANTENNA. SIDE MOUNT EXHAUST, KNOCK-OFF WHEELS WITH GOLD LINE TIRES. 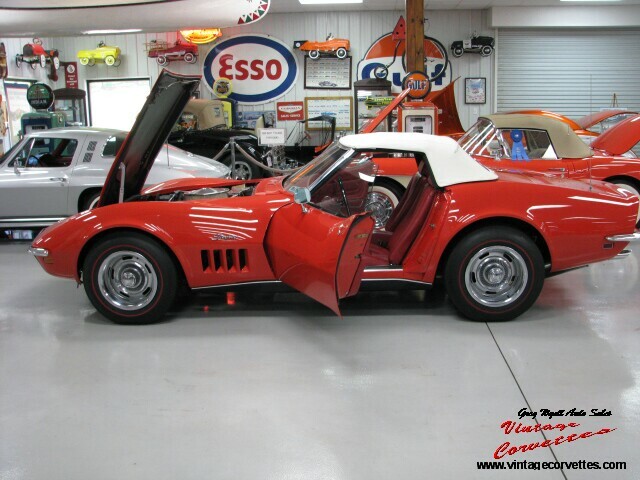 ALL MATCHING NUMBERS CAR RESTORED TO SHOW CONDITION. NO HIT BODY! PROTECTO PLATE AND OWNER HISTORY BACK TO NEW. ROMAN RED WITH RED INTERIOR AND WHITE SOFT – TOP. 327 – 360 HP FULIE 4 – SPEED. POSI : REAR, COURTESY LIGHT, SUNSHADES, SEAT BELTS AND WASHER SYSTEM. NCRS PREPARED – FRAME OFF RESTORED TO SHOW CONDITION. JUST COMPLETED – ALL NEW 62! LYNNDALE BLUE WITH TEAL BLUE INTERIOR AND BLUE SOFT – TOP. 327 – 300 HP / 4 – SPEED. POWER STEERING, POWER BRAKES, ALUMINUM WHEELS WITH RED LINE TIRES. AM – FM RADIO, SIDE – MOUNT EXHAUST. 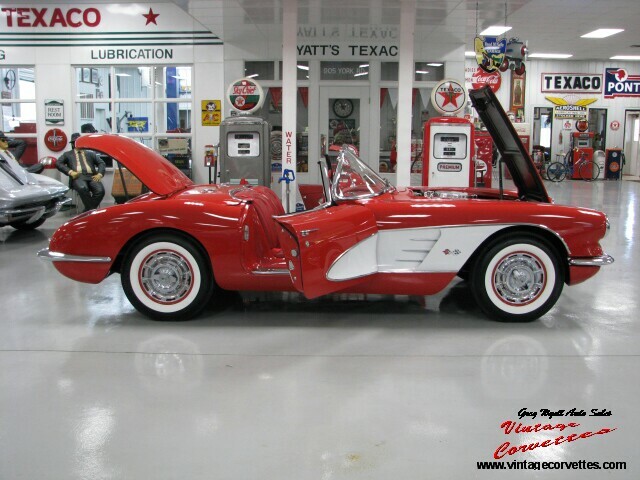 COMPLETE PROFESSIONAL FRAME OFF RESTORATION TO A CONCOURS MUSEUM QUALITY INCLUDING ALL STENCIL MARKINGS. 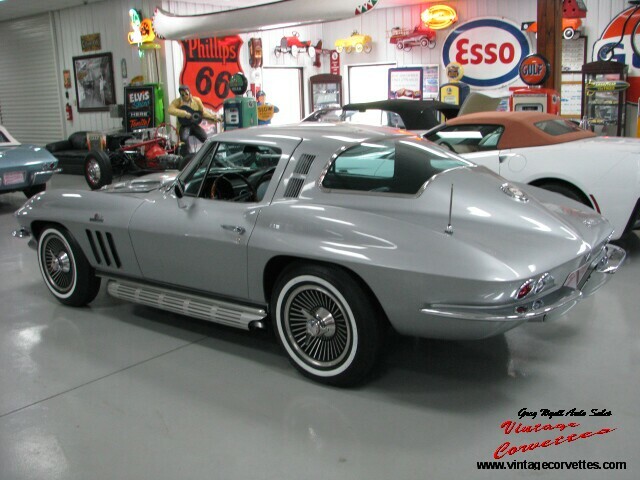 ONE OF THE FINEST 67’S AVAILABLE. THIS CAR IS NICER THAN THESE PHOTO’S SHOW IT TO BE! SILVER BLUE WITH SILVER BLUE INTERIOR AND SILVER COVE. (2006 PRODUCED AND ONLY 757 WITH SILVER COVE). BLACK SOFT – TOP ONLY. 283 – 250 HP FUELIE(ONLY 504 PRODUCED) / 4 – SPEED. NCRS TOP – FLIGHT WITH A SCORE OF 96.8. 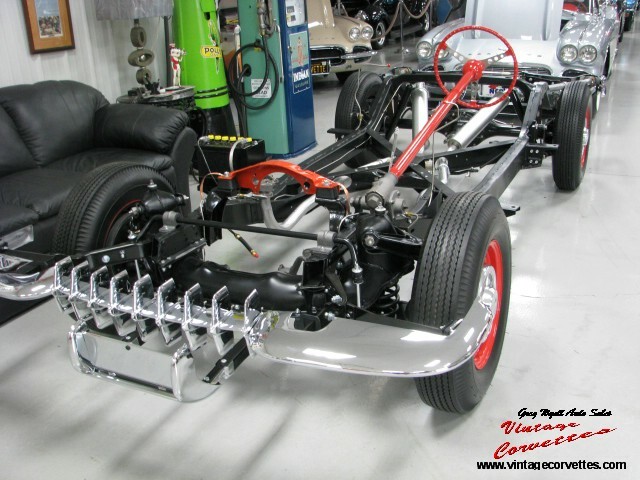 COMPLETE FRAME – OFF RESTORATION TO SHOW CONDITION. ALL CORRECT NUMBERS, COURTESY LIGHT AND WONDER – BAR RADIO. 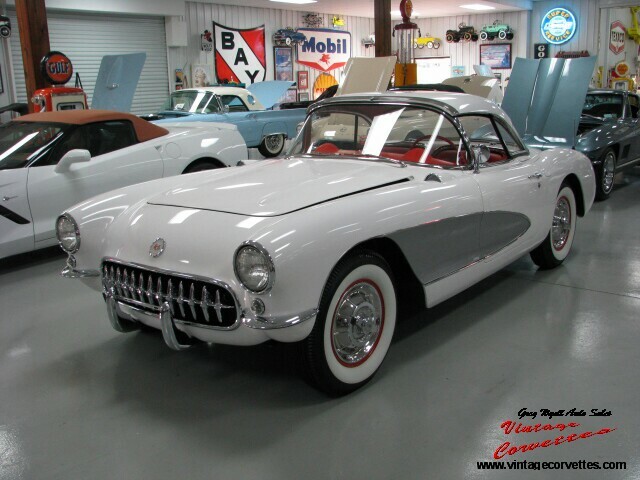 NICE 58 HISTORY! 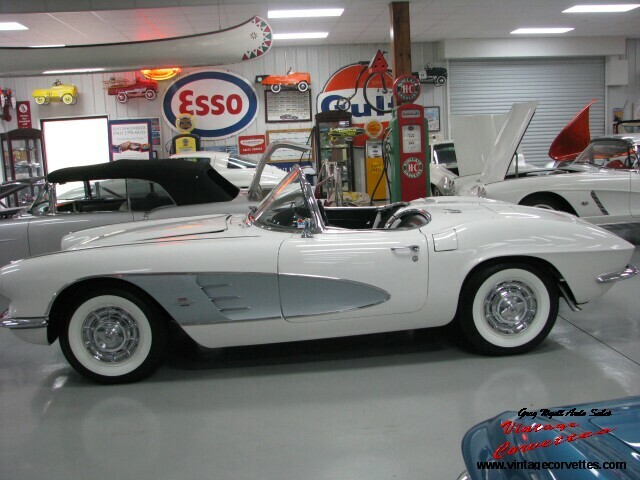 WHITE CORVETTE CONVERTIBLE WITH SADDLE LEATHER INTERIOR AND SOFT-TOP. MATCHING #’S 327 – 300 HP 4 – SPEED. SIDE EXHAUST, TINTED GLASS, VINTAGE AIR, RALLY WHEELS AND RED LINE TIRES. RESTORED TO NEAR SHOW CONDITION. 1963 SPLIT – WINDOW COUPE. SEBRING SILVER WITH BLACK INTERIOR, 4 – SPEED, 4.11 POSI. FUEL INJECTION. AM/FM RADIO, 1400 MILES SINCE BODY OFF RESTORATION. MATCHING NUMBERS , NCRS TOP – FLIGHT. STRAIGHT BODY AND FRAME. WILL SELL WITH HUBCAPS OR KNOCK-OFFS OR BOTH. RESTORATION PHOTO’S. INVESTMENT QUALITY CAR! 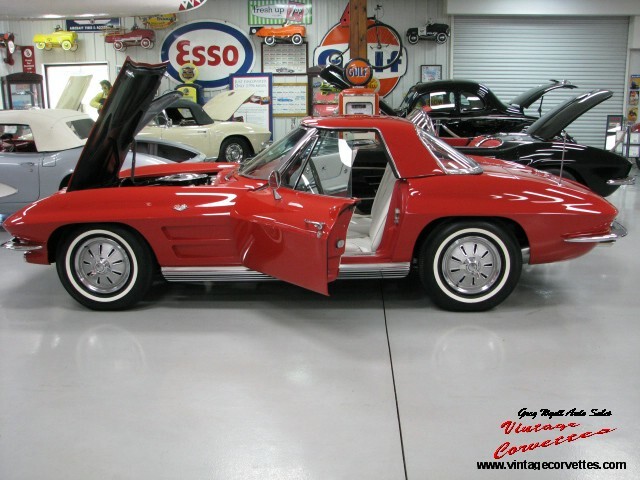 1963 CORVETTE CONVERTIBLE – SOLD!! 327 – 340 HP, 4 – SPEED WITH ADD ON AIR (NEATLY DONE). 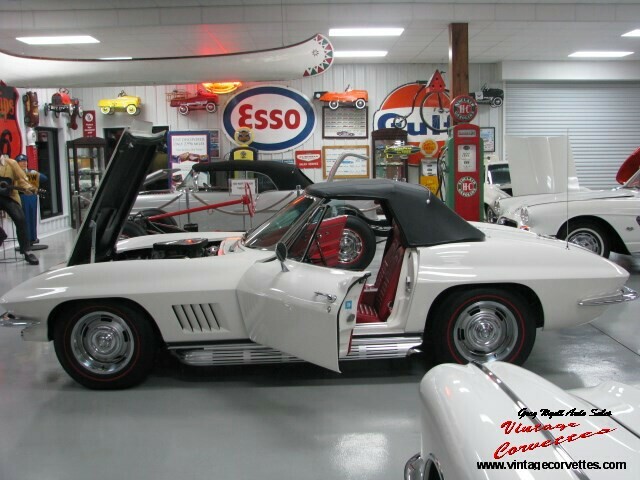 WHITE WITH RED INTERIOR AND WHITE SOFT-TOP. COMPLETE RESTORATION TO NEAR SHOW CONDITION. KNOCK – OFF WHEELS, RADIO, TINTED GLASS. RECEIPTS AND SOME OWNER HISTORY. RUNS AND DRIVES GREAT!